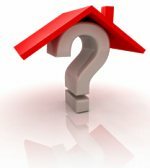 Frequently Asked Questions about the construction project. Tech dept work area located by the HS office. 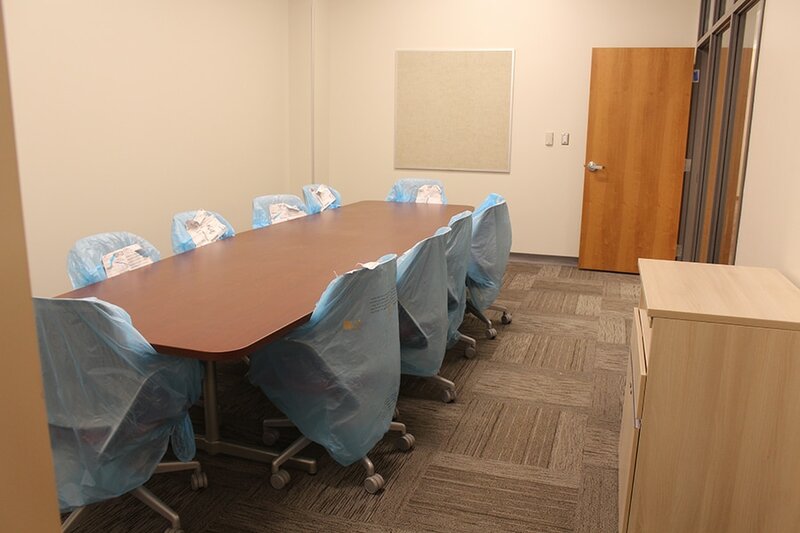 Conference room in the office area. 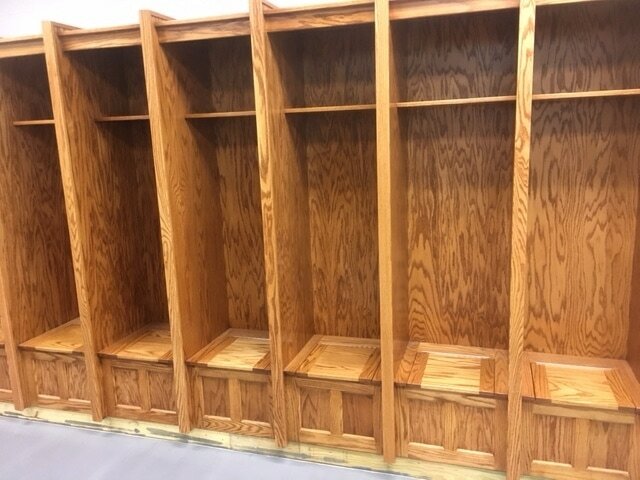 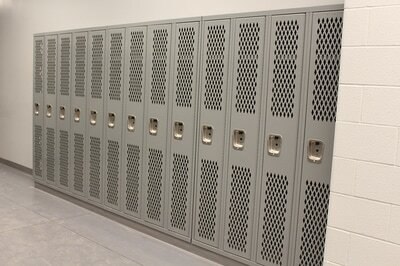 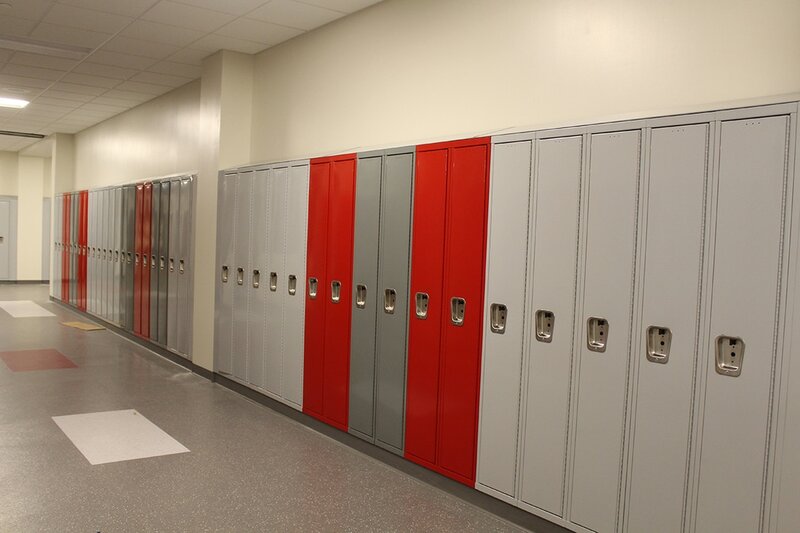 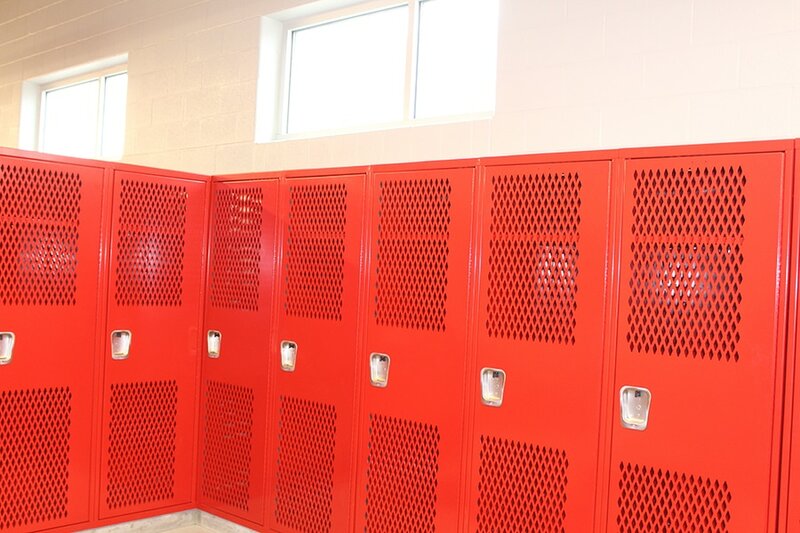 Lockers are in around the school. 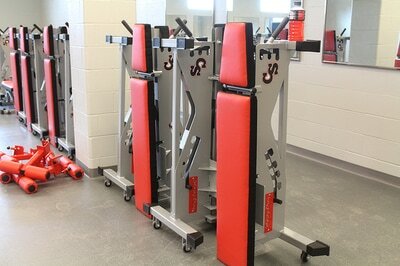 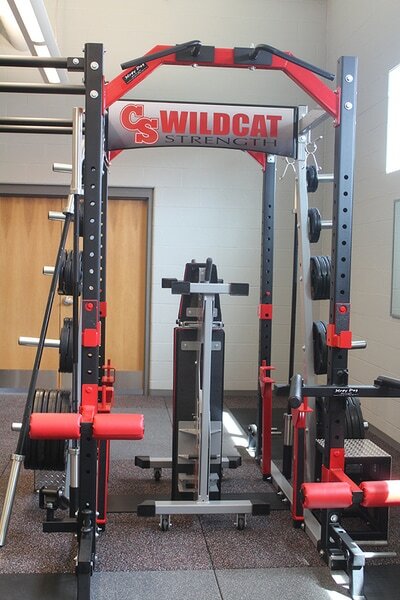 These are in one of the locker rooms. 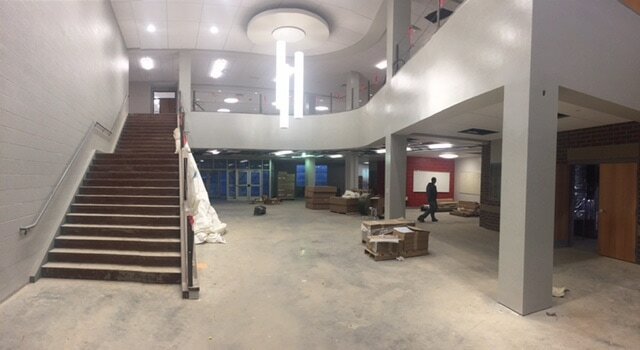 The hanging lights have been installed at the main entrances. 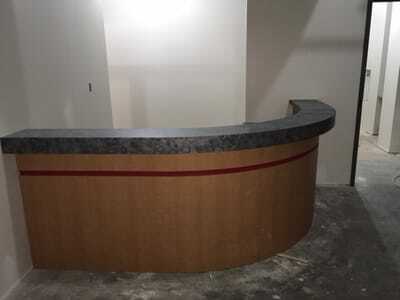 This is the counter for the concession stand outside the gym and auditorium. 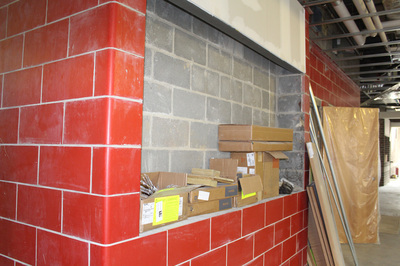 Display cases are installed in the student entrance areas. 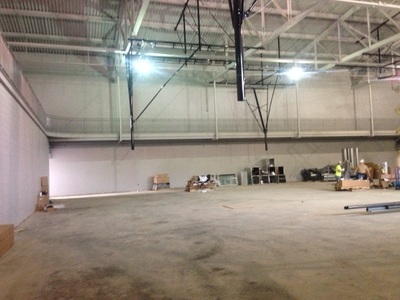 The rubber floor is down in the weight room. 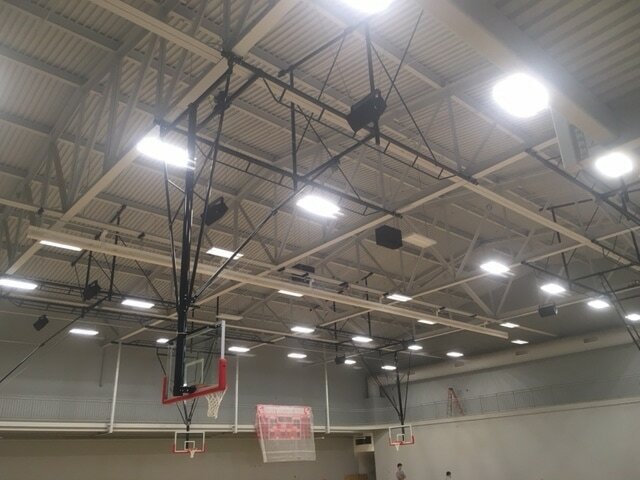 ​Red Ash Gym is getting the final sound pads in the ceiling and then is ready to have the floor finished. Workers are taking the tape off the the Aux gym floor after painting the lines. 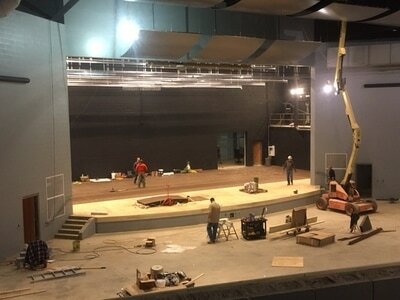 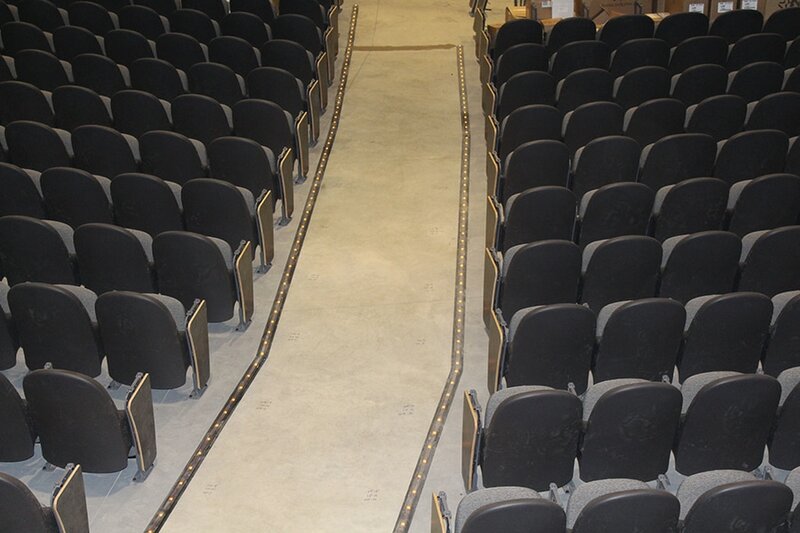 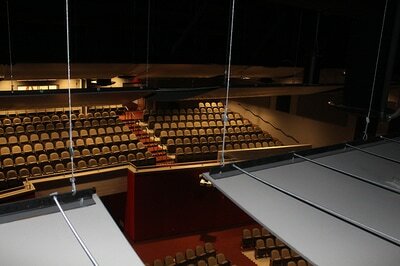 This is a view from the balcony of the stage floor being installed. Carpet is down in the Board Room.....there is carpet in this room, the offices and the teacher planning areas. 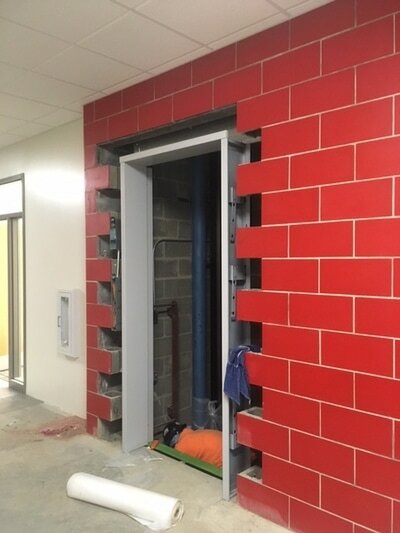 Elevator work is finishing up. 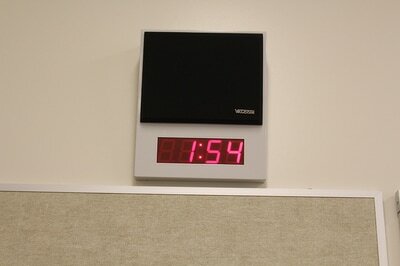 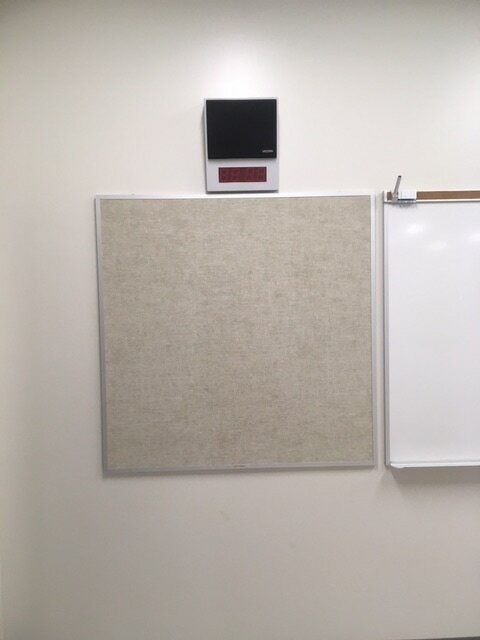 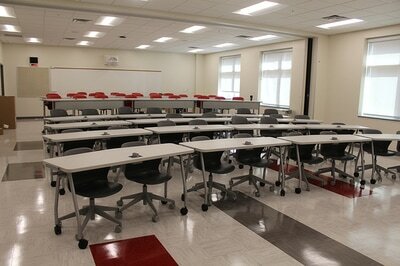 The PA speaker/Clocks are installed in the classroom....now all we need is projectors installed and rooms are complete. 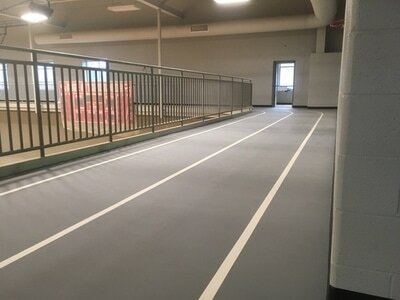 Rubber base is down on the walking track. 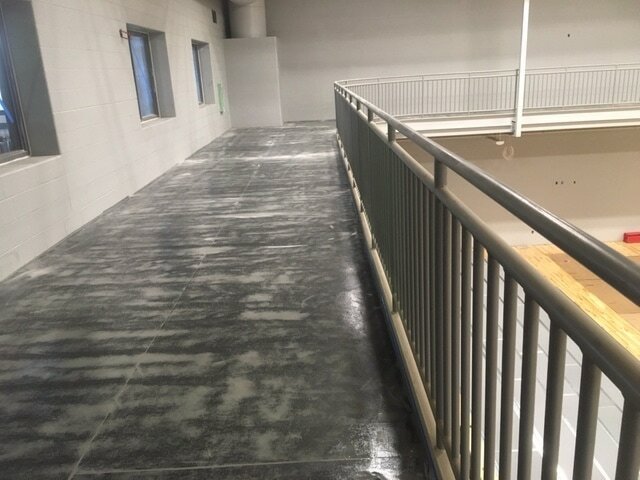 They are expecting to have finish coat and lines down by the end of the week. Bleachers are in the gym. 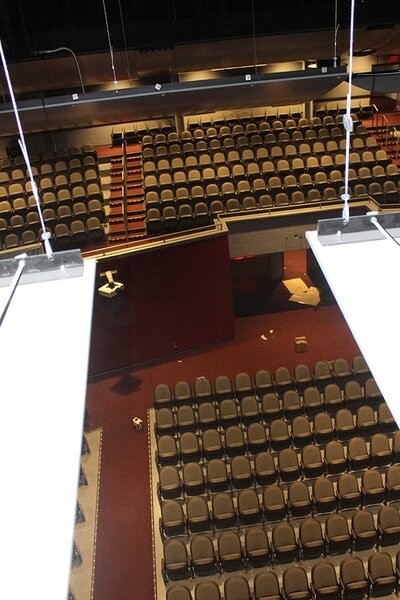 House lights are in the process of being hung in the auditorium. Rubber flooring is going down in the multipurpose/wrestling room and the weight room. 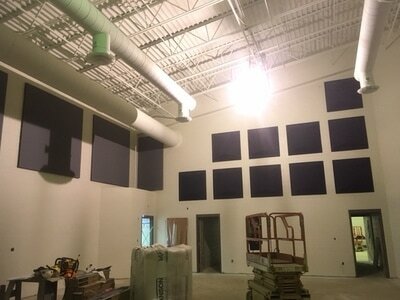 Acoustic panels are up in the band room. ​Bathroom partitions are being installed around the building. 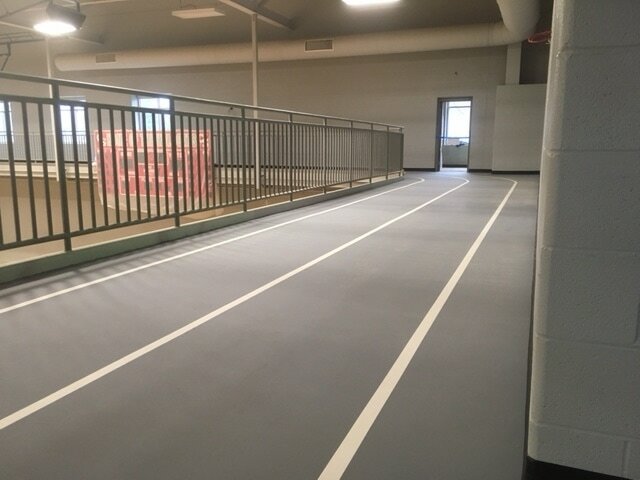 Rubber flooring is finished in the second floor area. 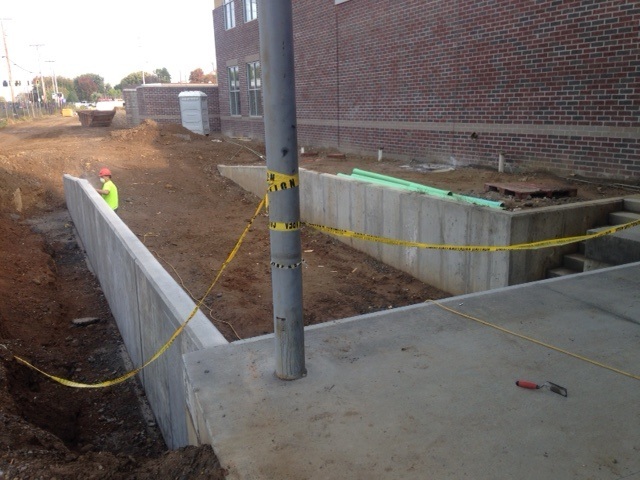 Work has begun on the north elevator. 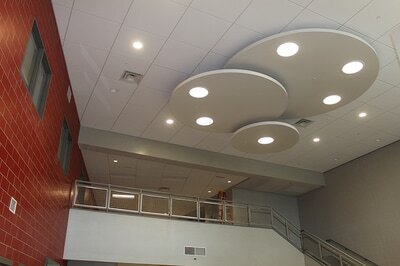 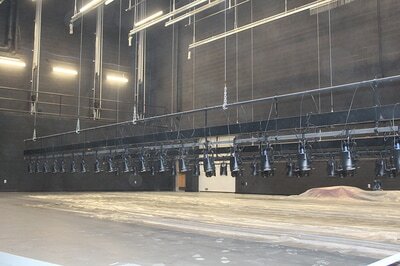 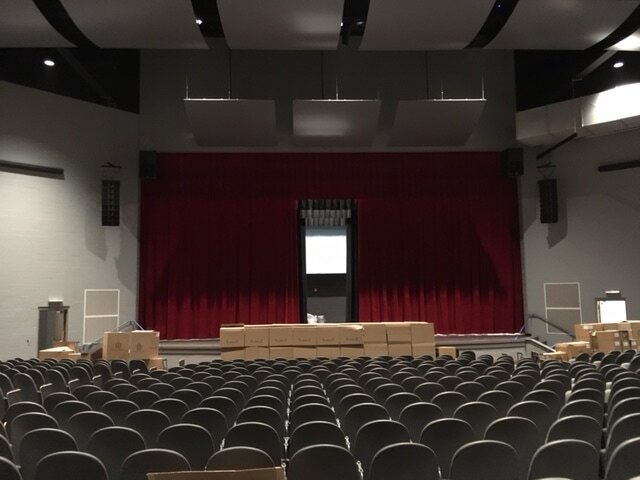 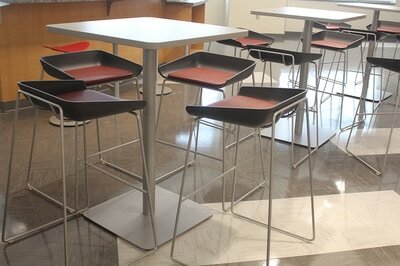 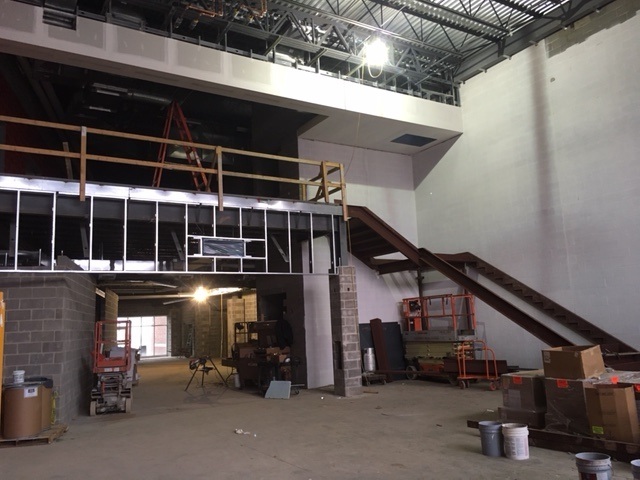 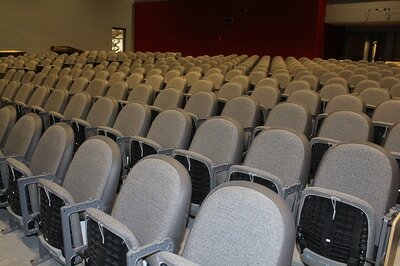 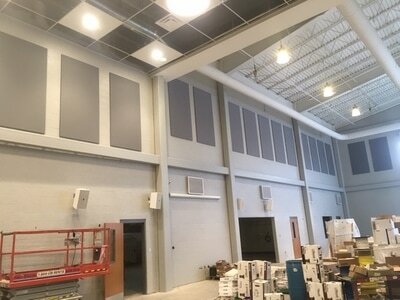 ​Cafeteria lights, acoustic panels, sound system, and screens have been installed. 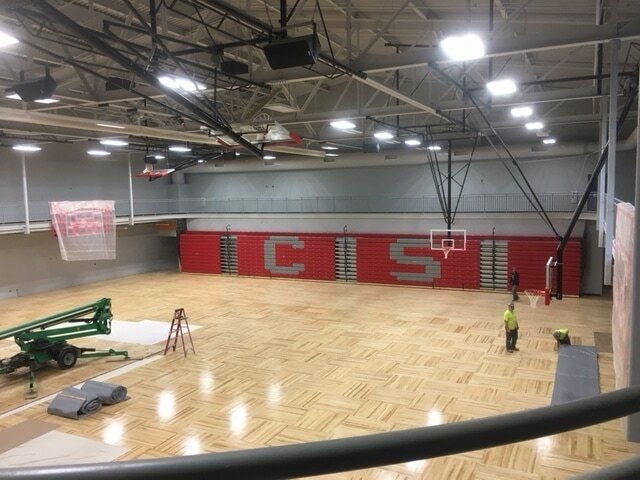 ​View of gym floor from the walking track. All the wood is down and it has been sanded. 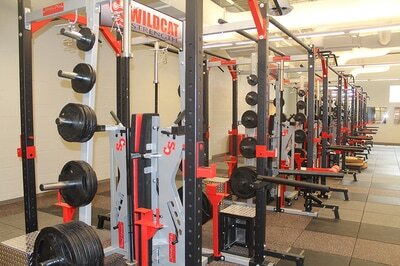 Next step will be bleacher install. The first coat of sealer has been put on the aux gym floor. 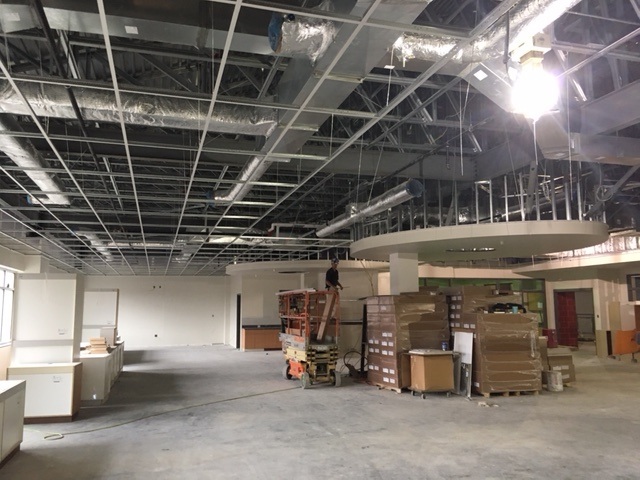 The ceiling grid and lights are being added in the Design Center. Picture of the theater from the balcony. 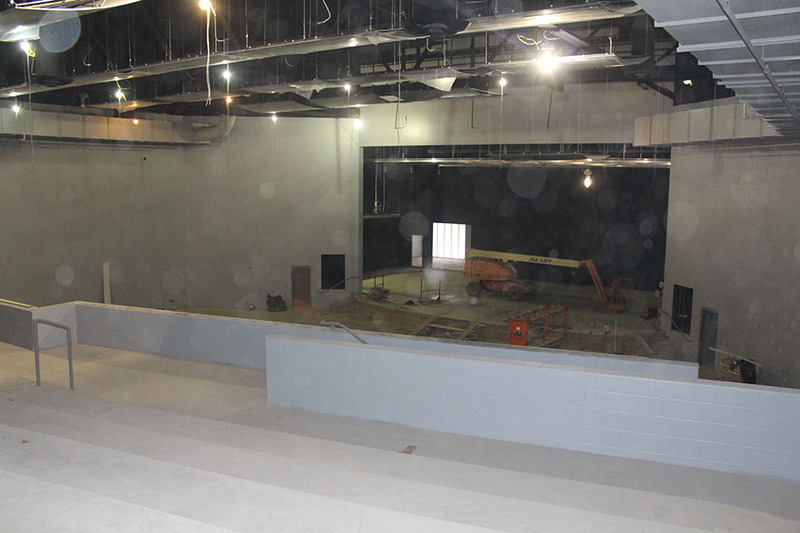 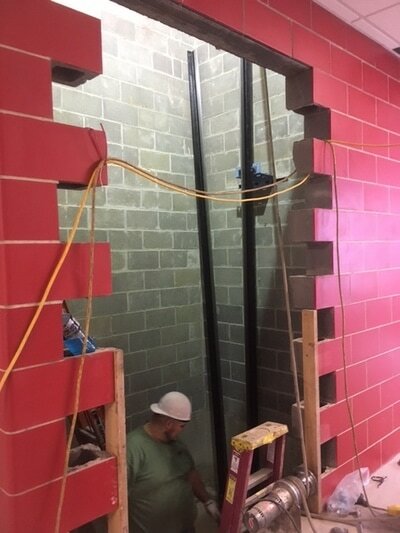 ​Workers are installing the acoustic tiles in the theater. 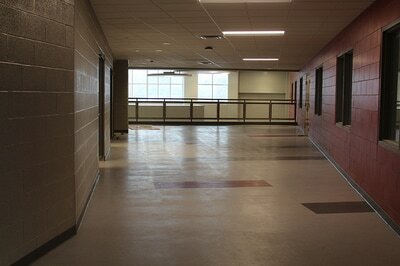 The hallway outside the HS office. The red block has been polished. 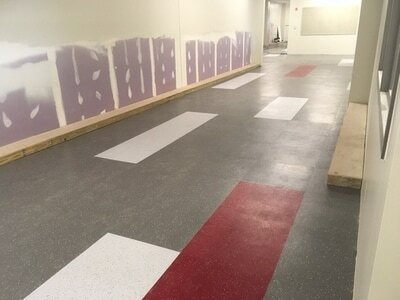 ​The rubber floor in hallways has begun to go down. 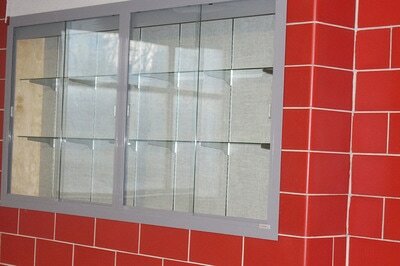 ​Most of the display cases in the building have been installed. 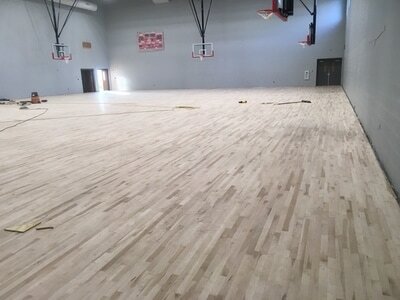 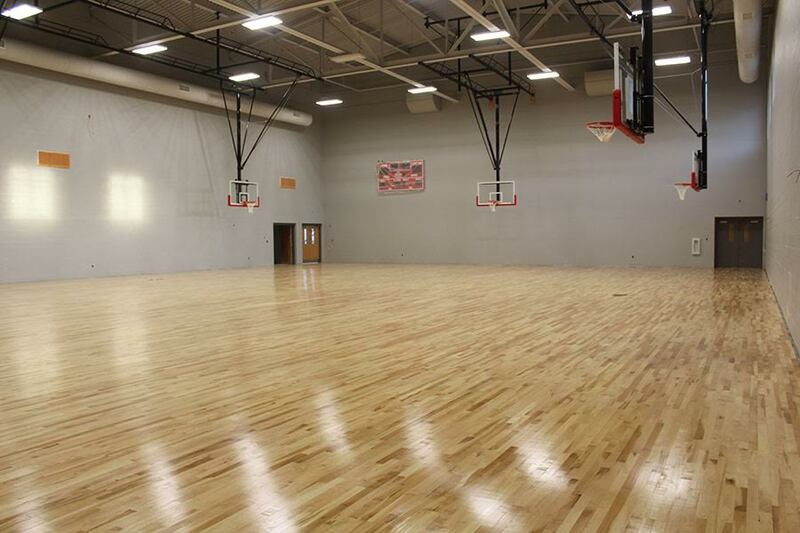 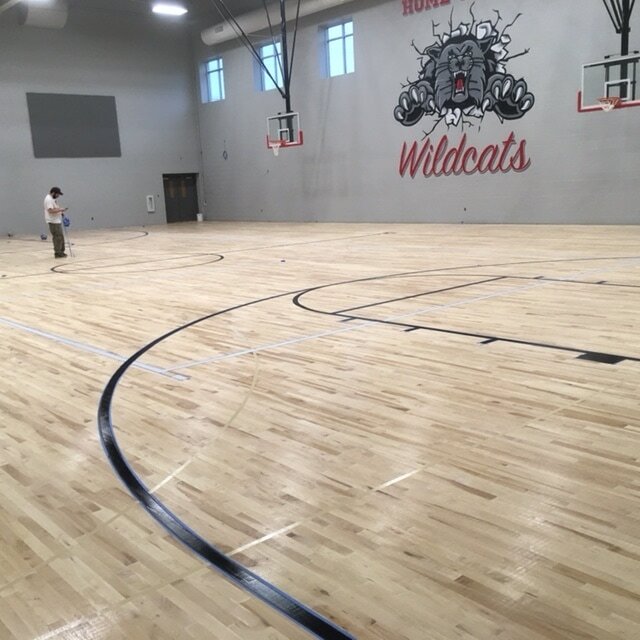 ​The floor in the auxiliary gym is down and ready to be sanded and have the finish put on it. 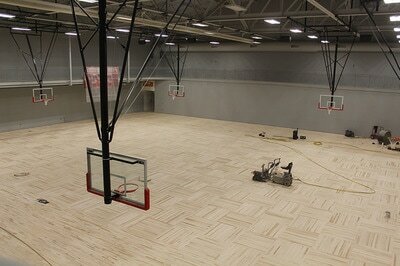 Here is a picture from the walking track of the Red Ash Gym floor. 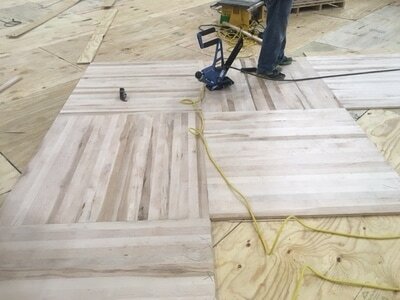 The Boston Square or parquet floor will give this a great look. Close up of gym floor. 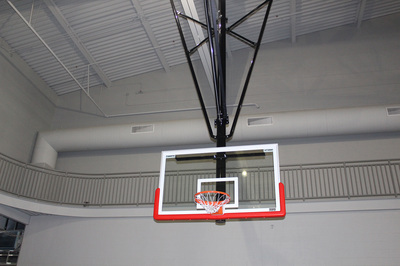 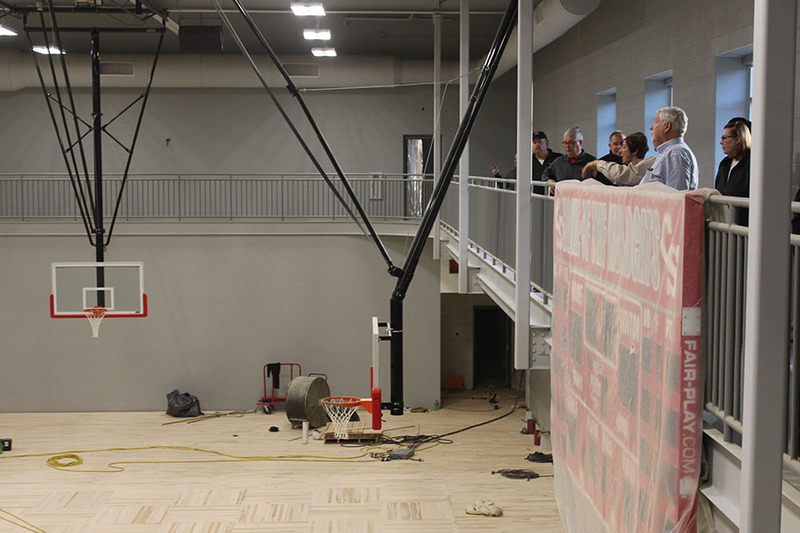 The speakers are installed in the gym ceiling. 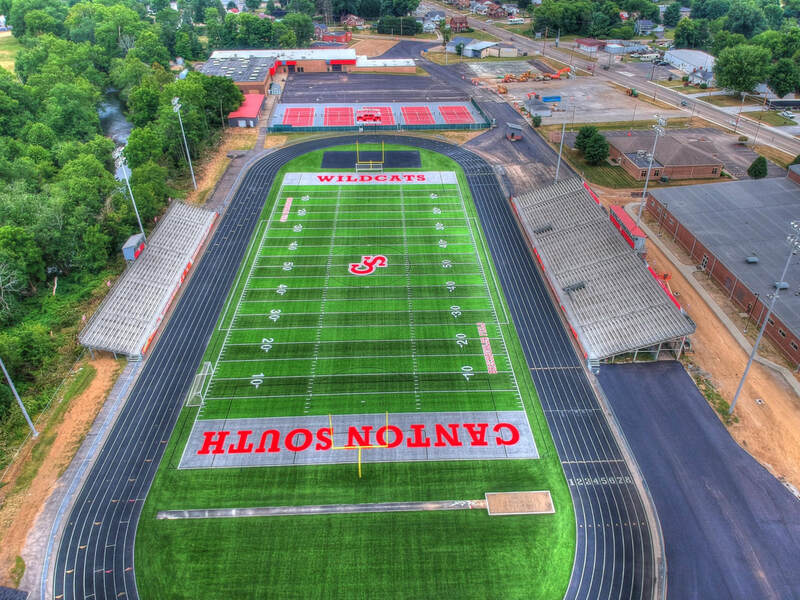 We can't wait for the first game so that we can understand what is being announced! 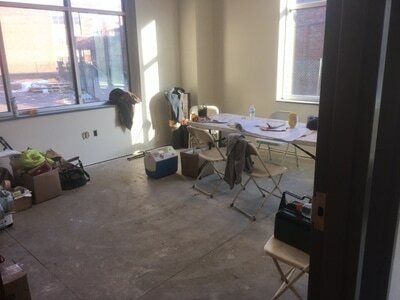 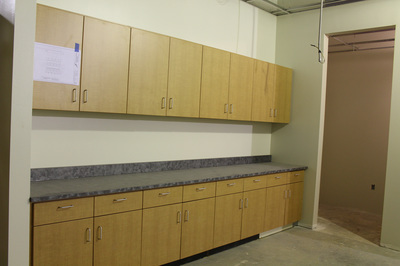 Superintendent Milano's office is currently being used as the construction worker's break room. 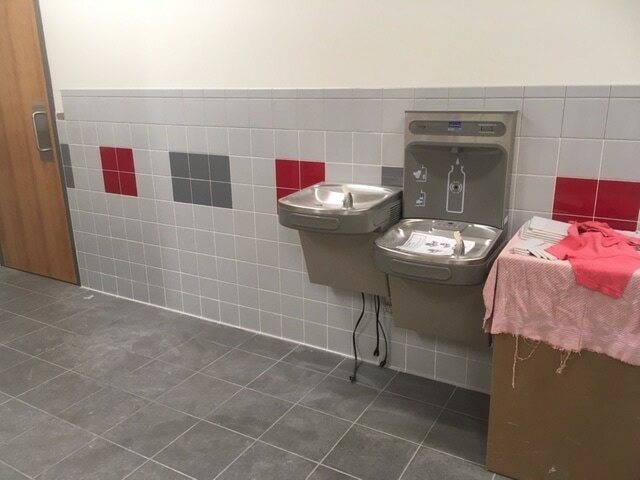 At each location, there is a regular fountain along with one that will fill bottles. 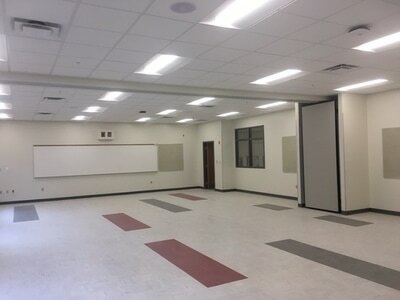 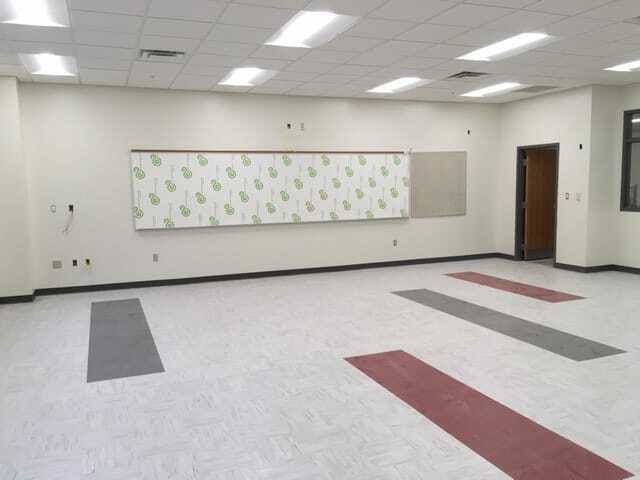 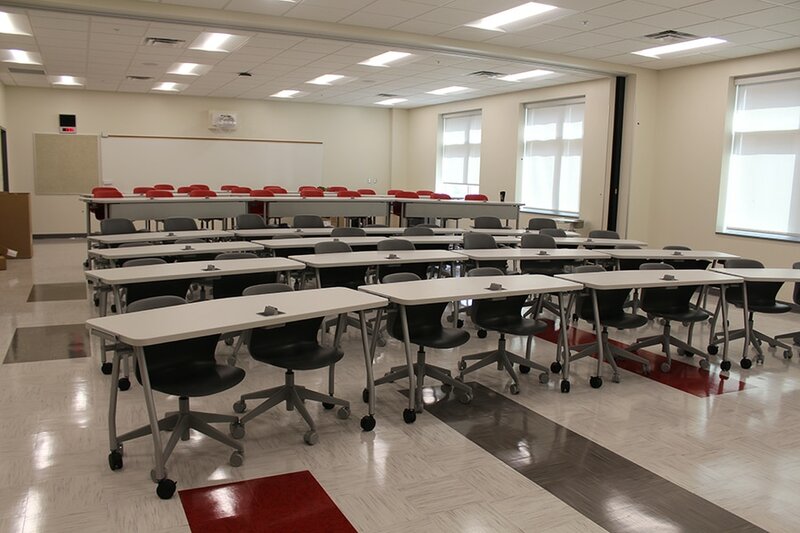 Picture of a classroom. 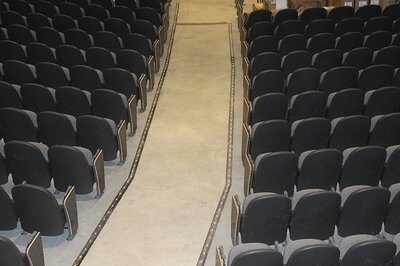 Only need to hang the projector, wax the floor and move furniture in and we are ready! 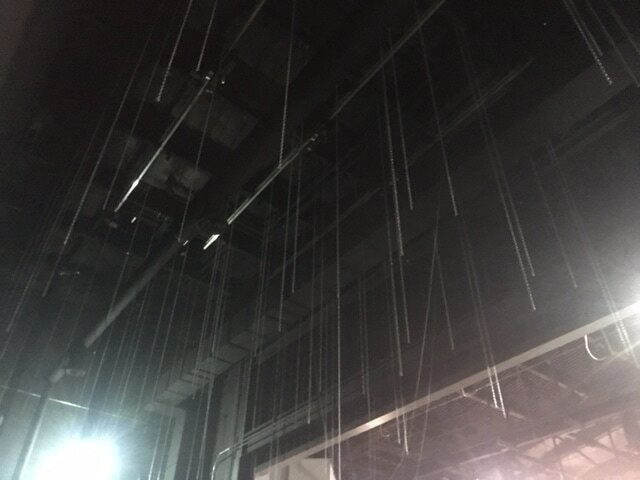 This is a picture in the theater of all the chains above the stage for lights, curtain and props. Most of the painting is complete. 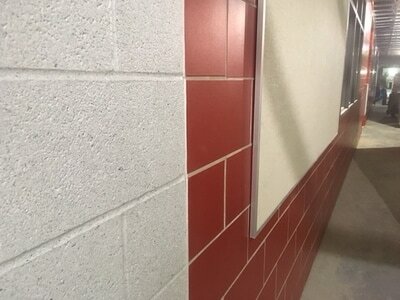 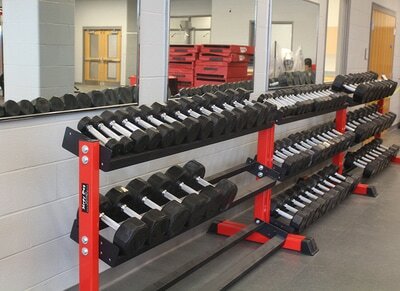 Here is a pic of the gray multispec paint that we used next to some of the red block. 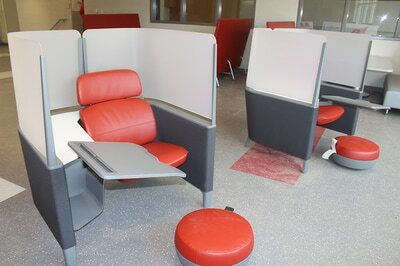 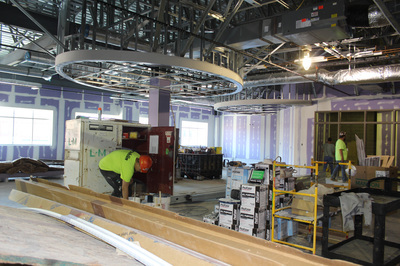 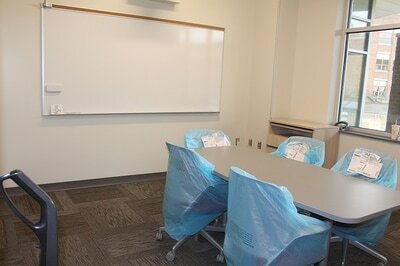 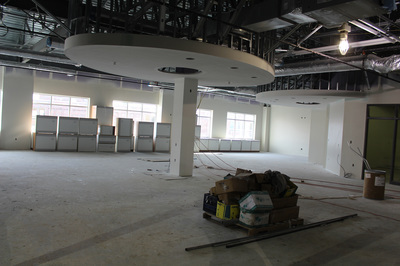 Ceiling tile and lights are installed in one of the collaboration areas in the academic area. 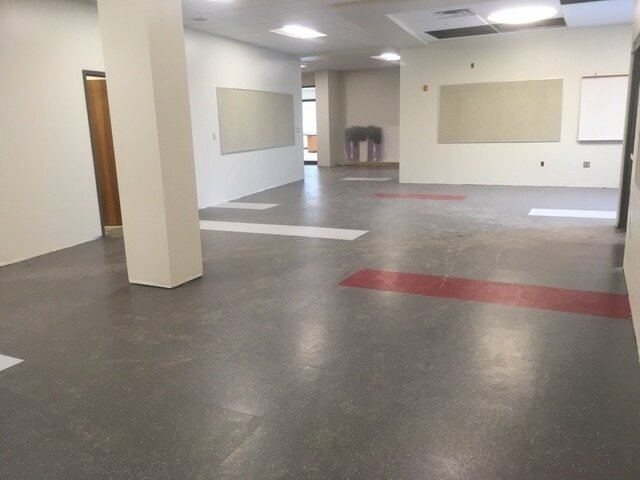 Base is installed, floors are swept......work in the academic area is very close to completion. 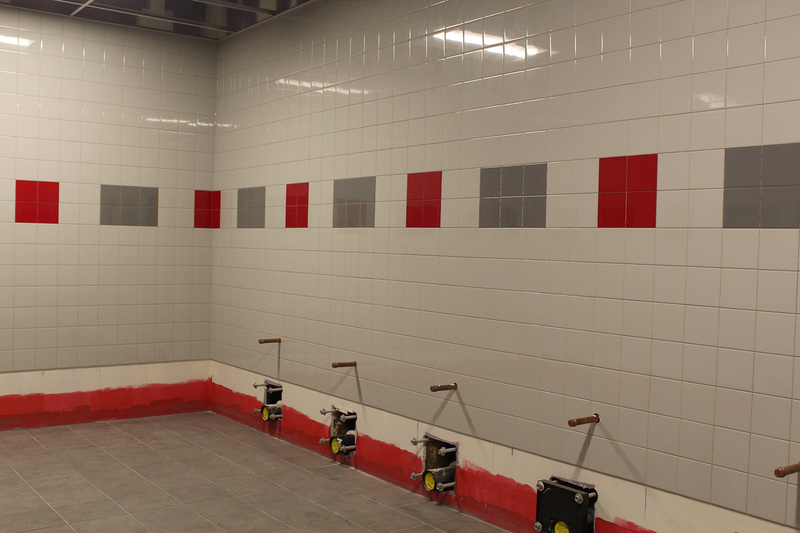 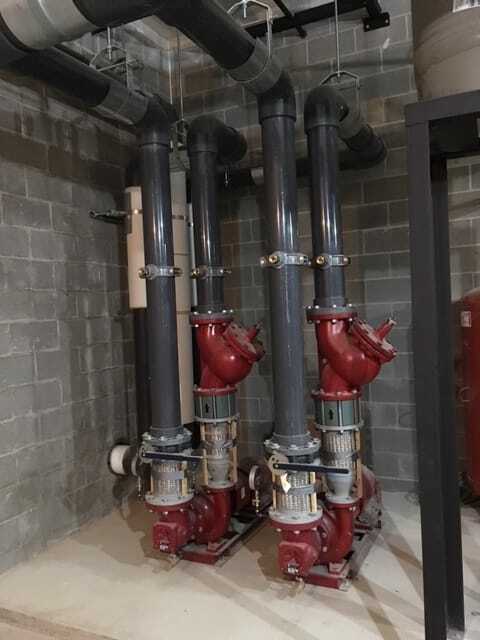 Even the pumps, valves and pipes follow our red and gray theme. 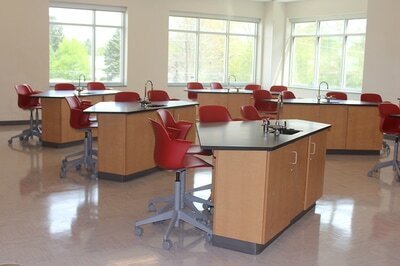 ​Second floor chemistry room. 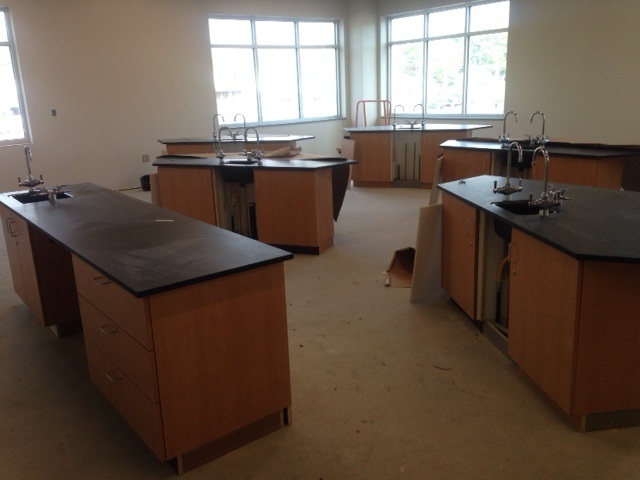 Floor in, boards up and fume hood installed. 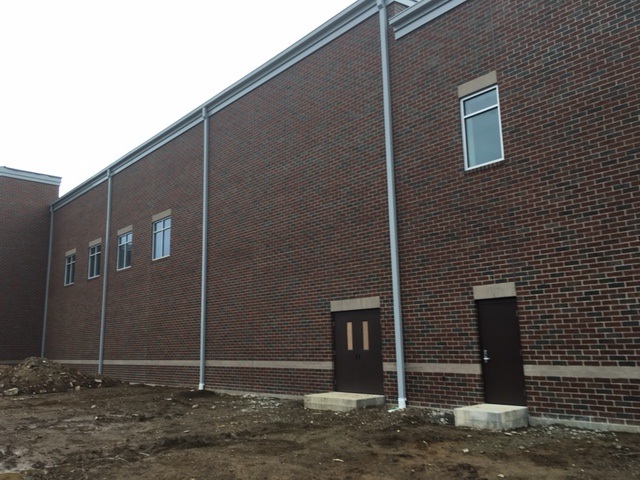 Downspouts have been connected on the Rt 800 side of the building. 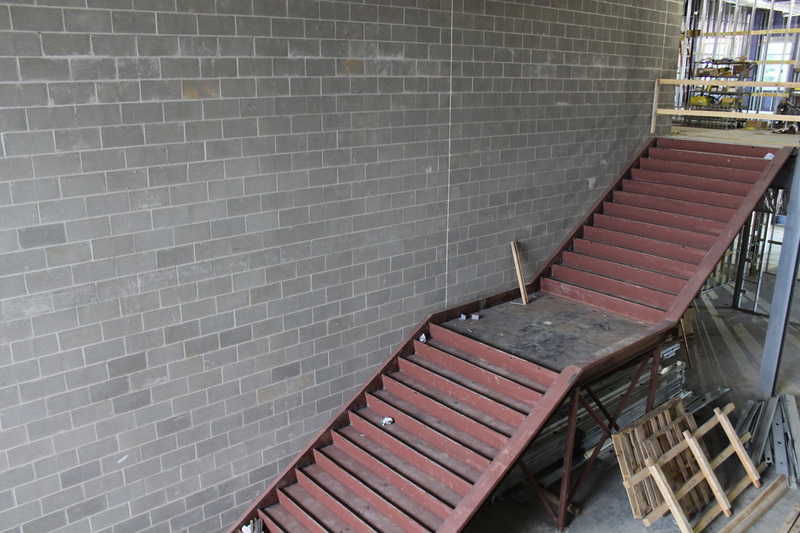 Steps are being installed in the event entrance between the auditorium and the Red Ash Gym. 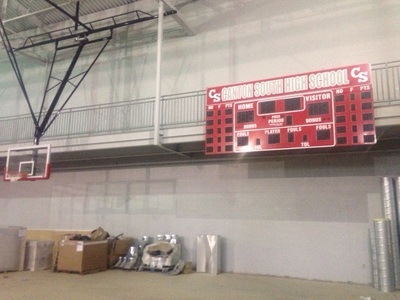 Scoreboards are up in the gyms. The ceiling grid is being installed in the Design Center. 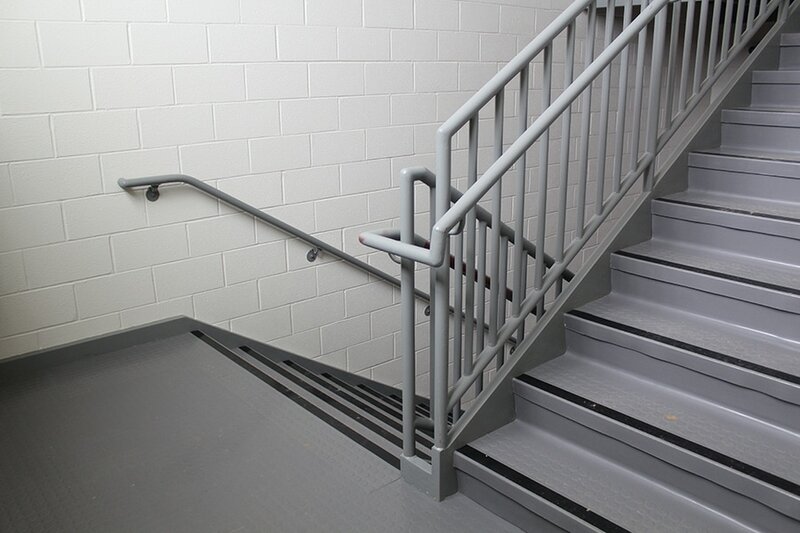 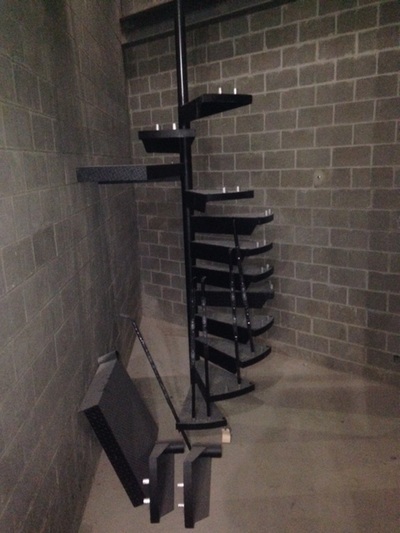 Spiral steps that will lead to the catwalk in the auditorium. 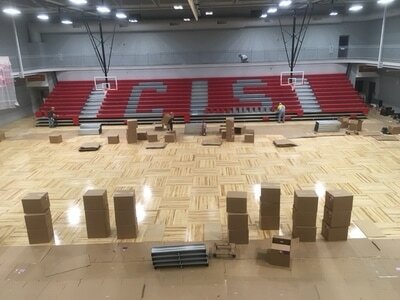 Floor boxes are being placed in the gym floor. 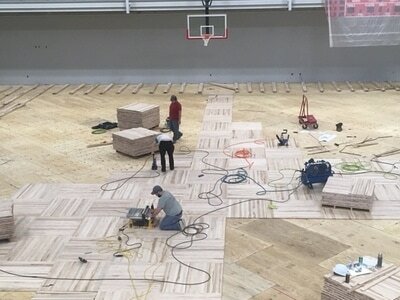 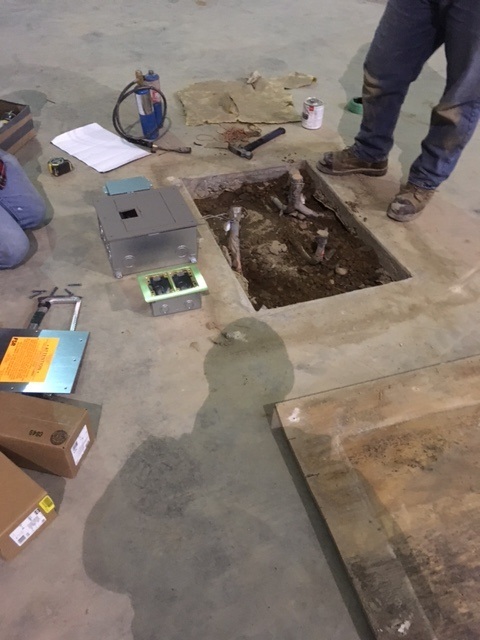 Working to prepare for installation of the wood floor. 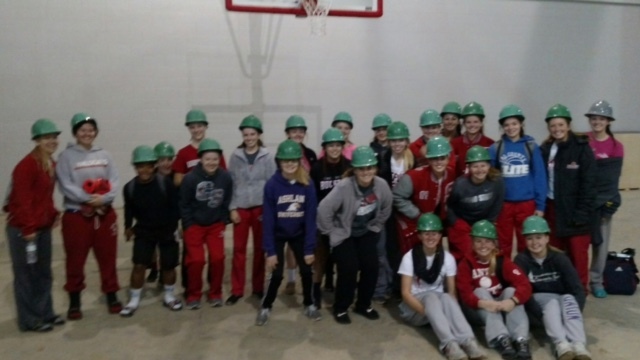 Girls basketball team takes a hard-hat tour - here they are in the gym. 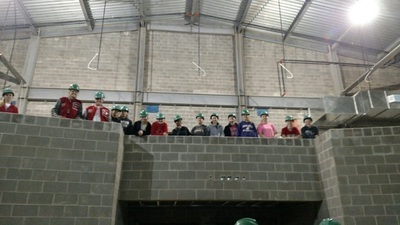 Girls basketball team looks over the balcony. Cafeteria walls are primed and ready for finish paint. 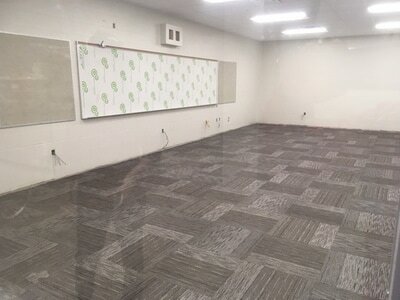 Classroom tile floors are installed and doors hung in the northern part of the building. Built in counters and cabinets in the upstairs teacher work area. ​Getting ready to hang the ceiling grid and lights in the Design Center. 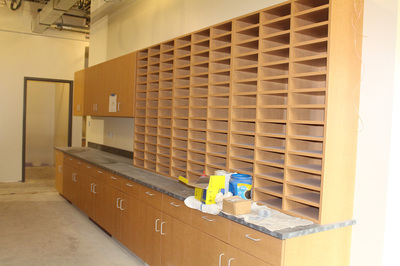 The staff mailboxes in the main office have been installed. 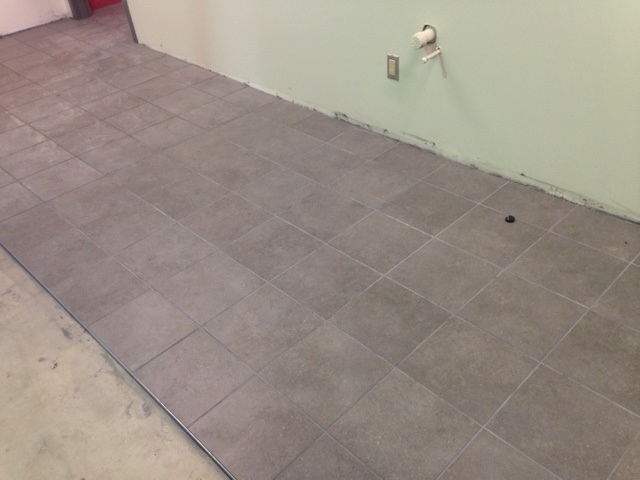 Bathroom tile has started to go up. When finished there will be tile all the way to the floor. 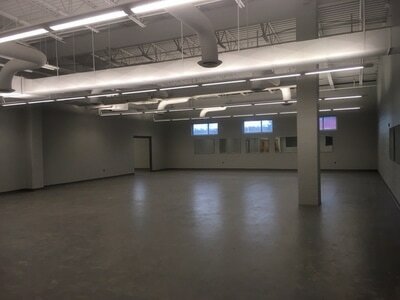 This is one of the 11 showcase areas. 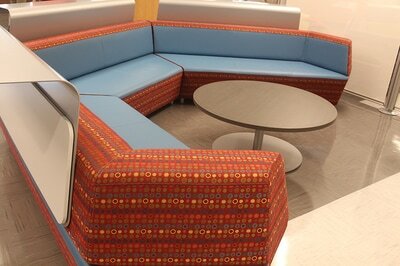 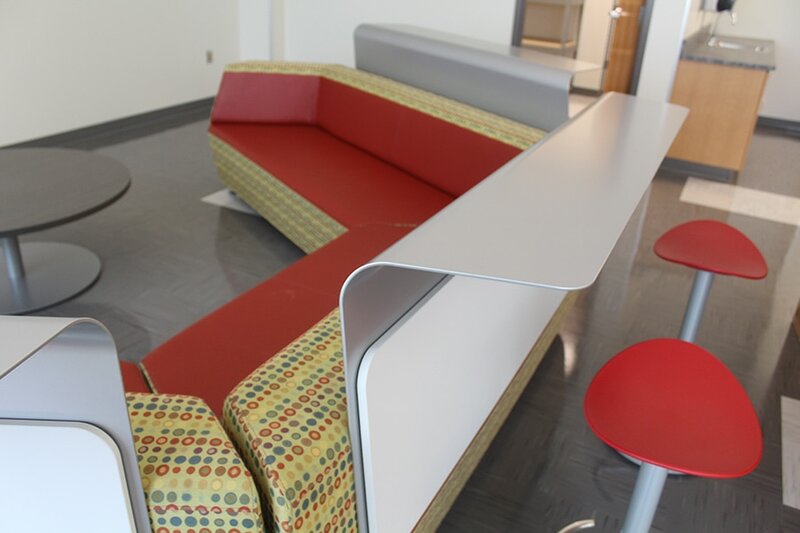 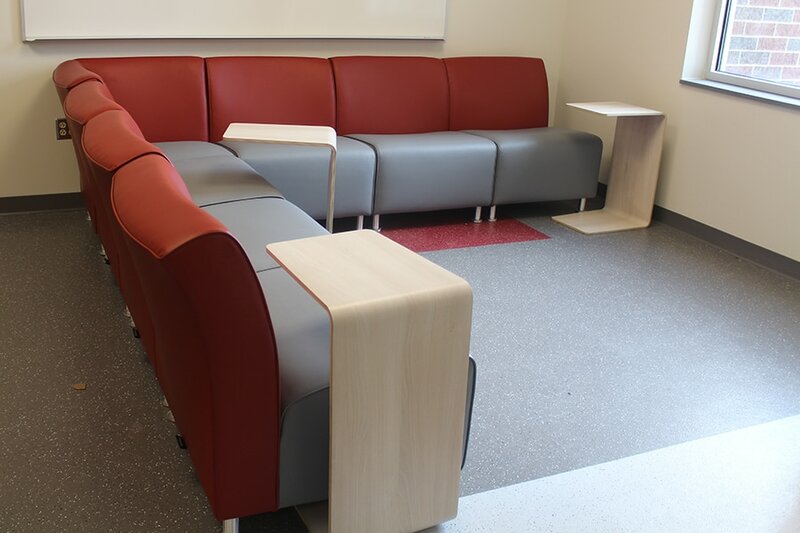 This one is one the second floor in the student gathering space. 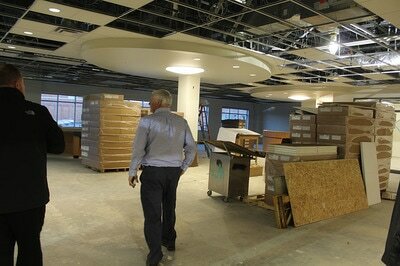 Ceiling tiles are starting to be installed in the north end of the building. Hoops are up in the gyms. 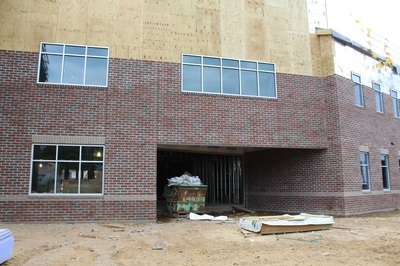 Work has begun this week pressure washing the bricks around the entire building. 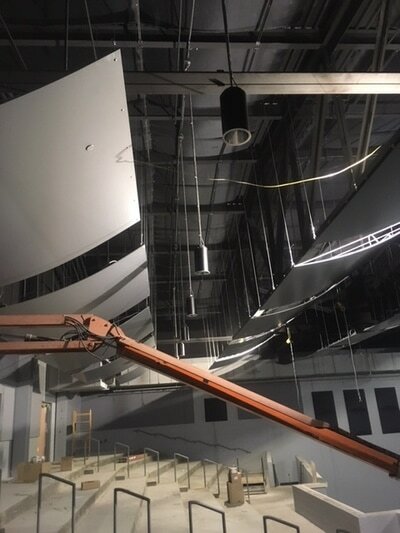 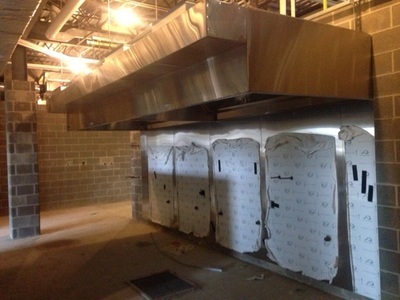 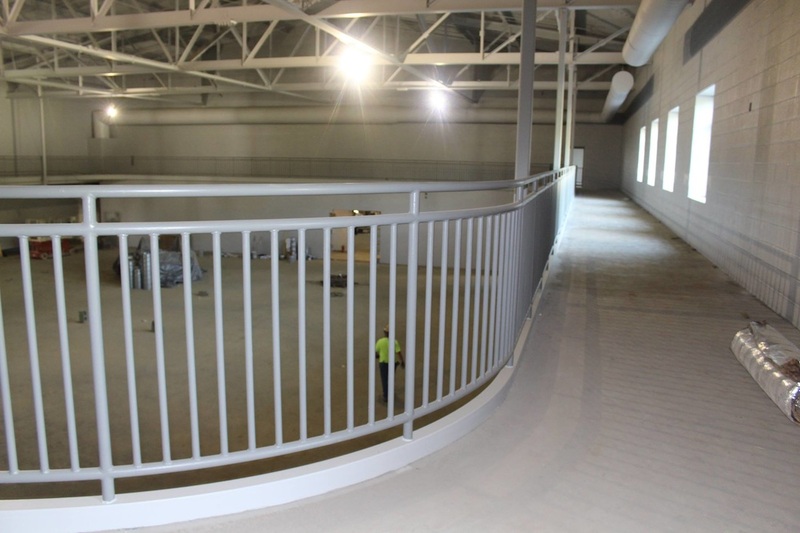 ​Duct work has been installed in the wrestling/multi-purpose area. 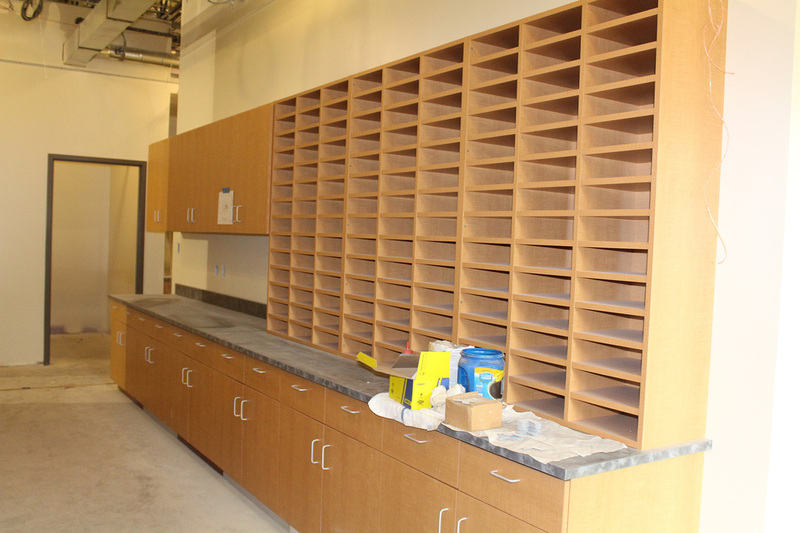 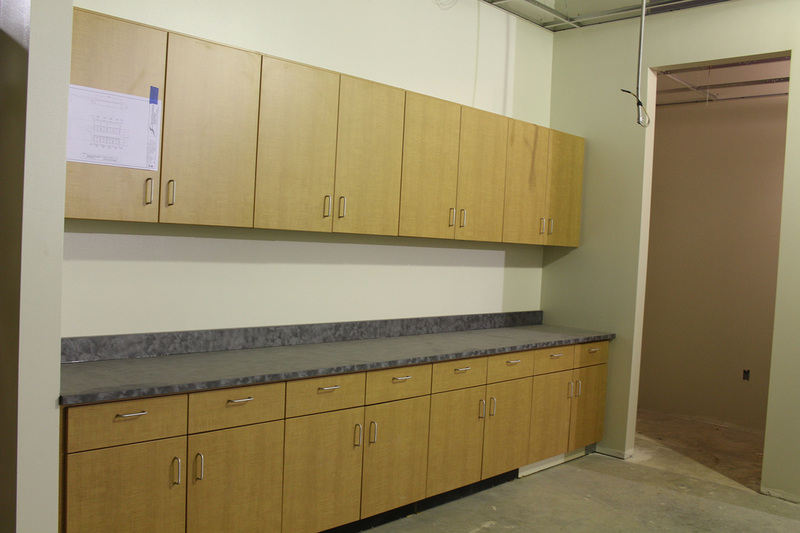 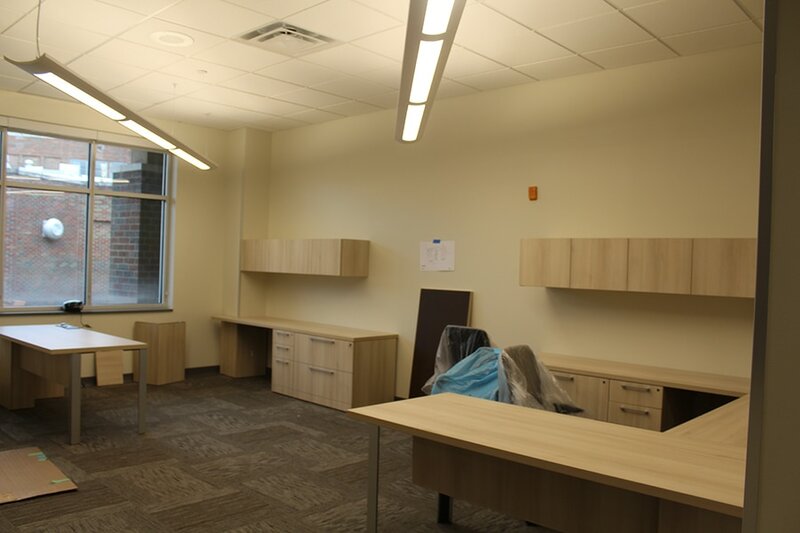 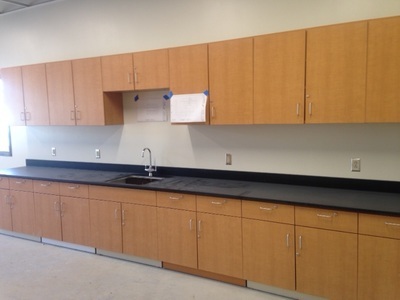 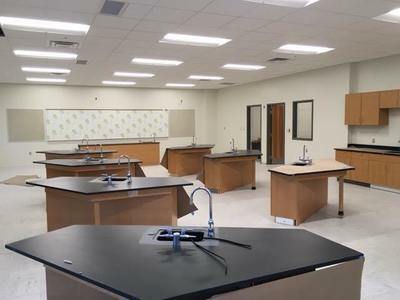 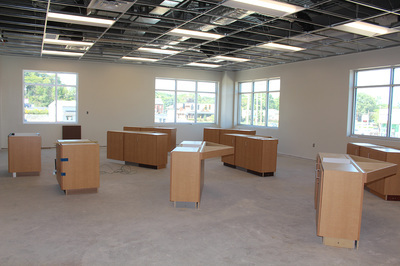 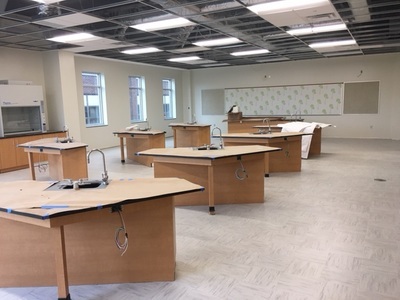 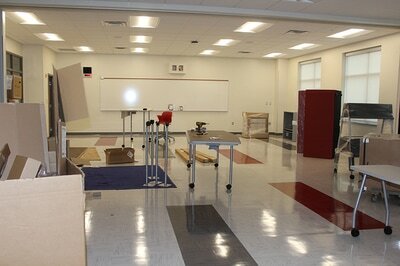 Cabinetry and fixtures have been installed in the science classrooms. 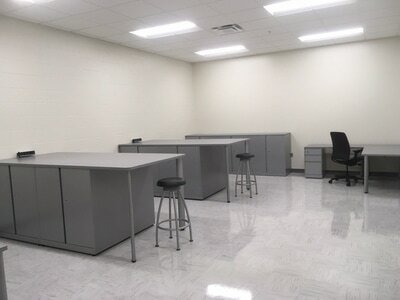 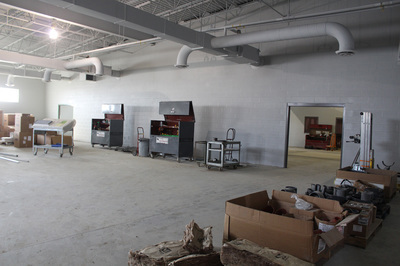 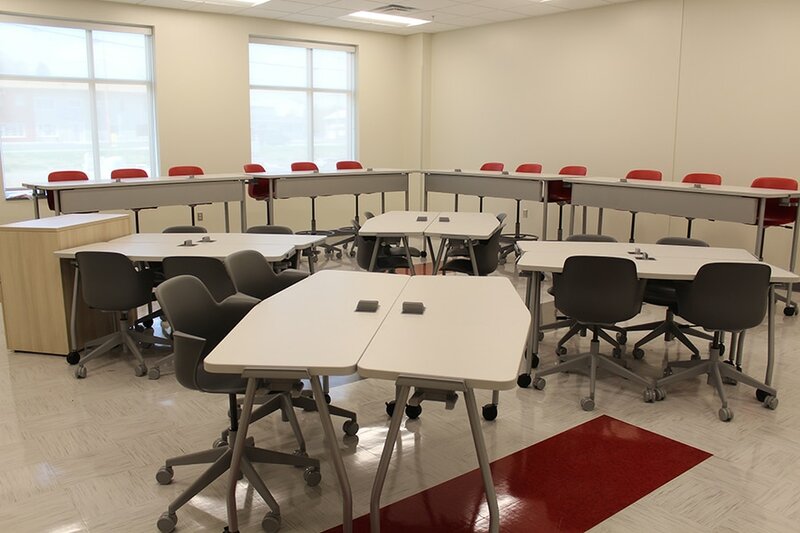 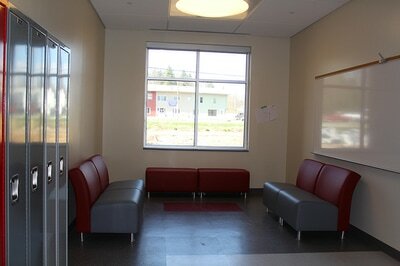 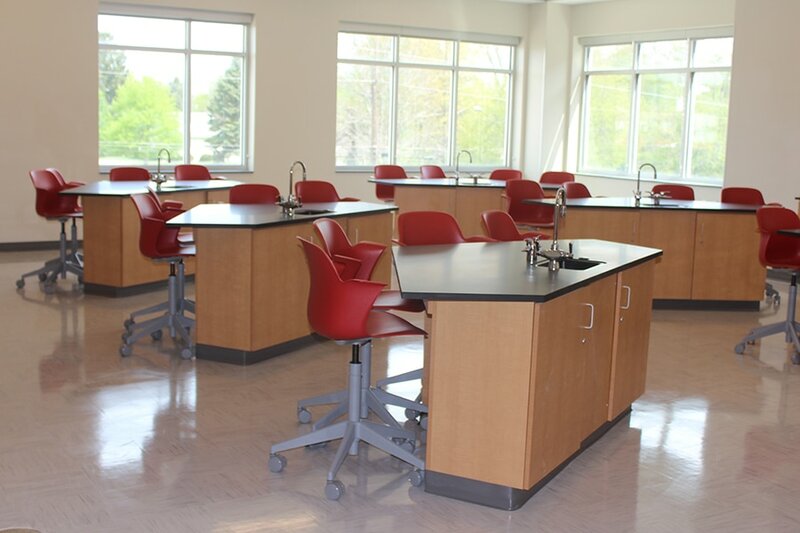 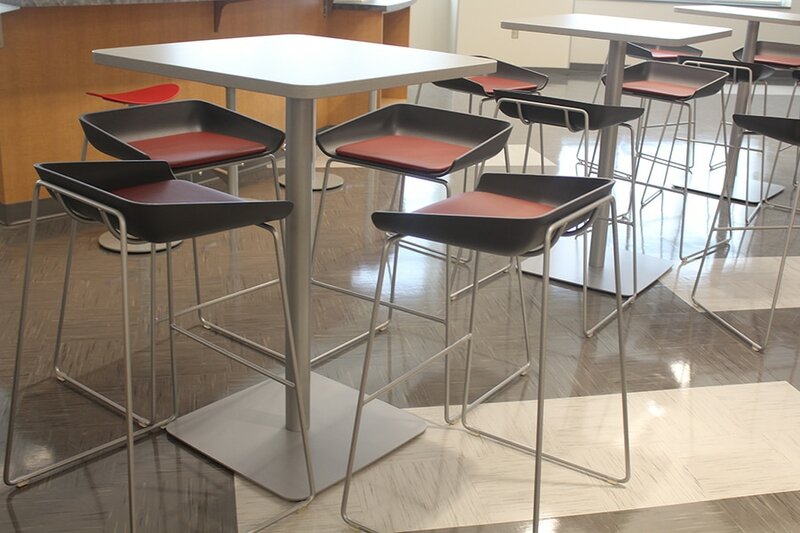 Teacher areas and student workstations have also been installed the science areas. 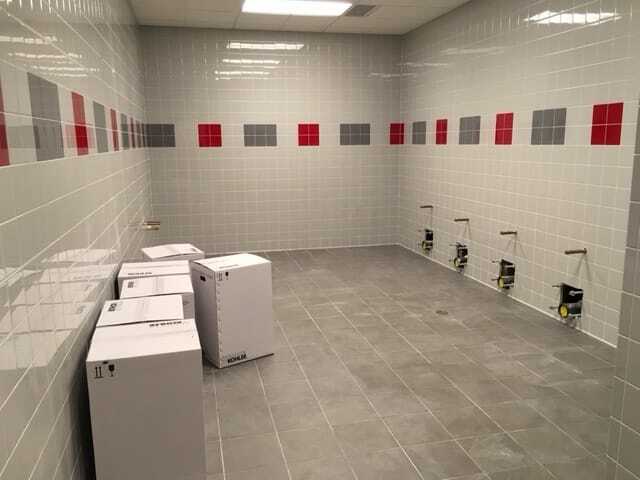 The gray tile has been laid in the restrooms in the academic end of the HS. 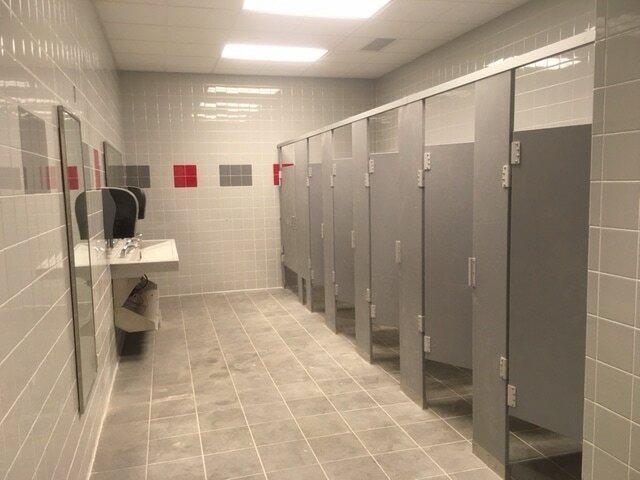 FYI, there are 6 sets of restrooms in the new building. 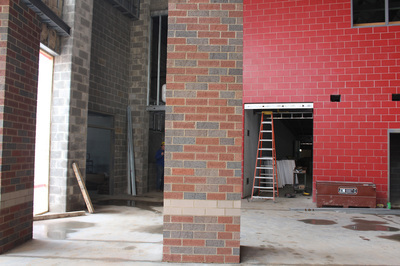 Four in the academic areas and two down by the auditorium and gyms. 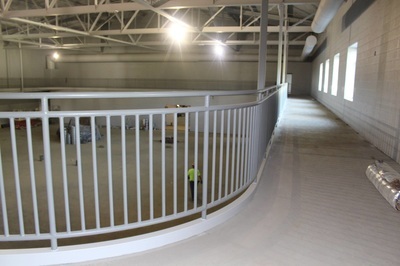 This a picture from the walkway overlooking the cafeteria. 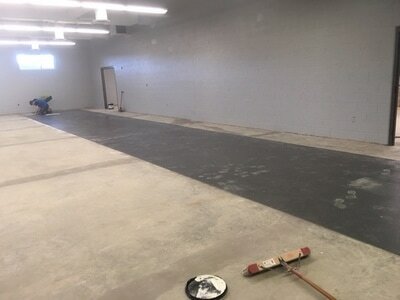 The walls are primed and ready for finish paint. 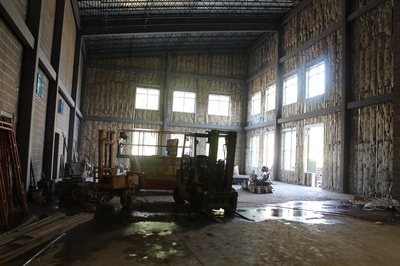 The loading dock (on the 800 side of the building) had the wall and landing poured recently. Workers doing the final touches on some of the detail work in the Design Center. 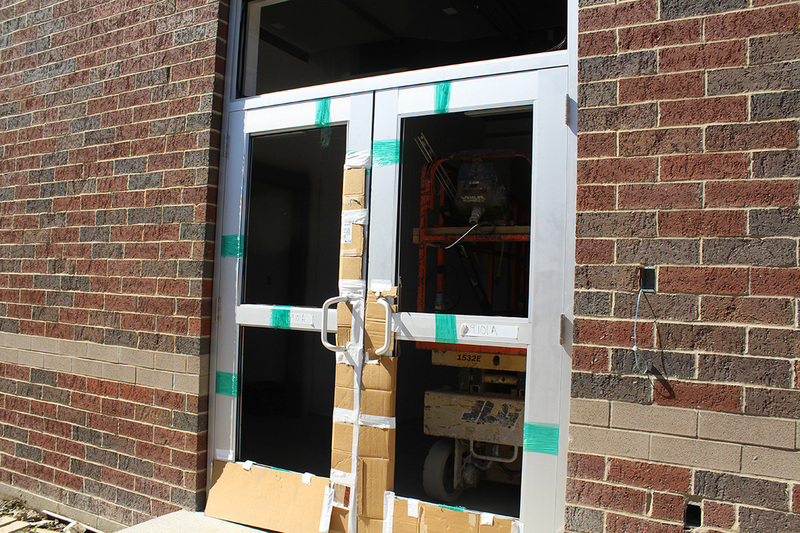 Exterior doors that have begun to be installed. 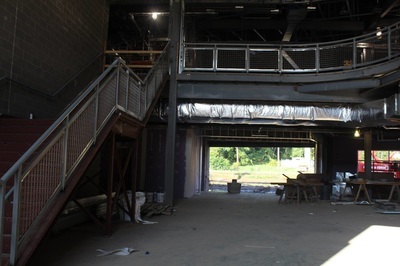 This one leads into the locker room area in the south end of the building. 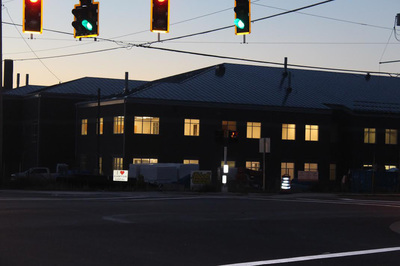 View from Faircrest and 800 in the morning. 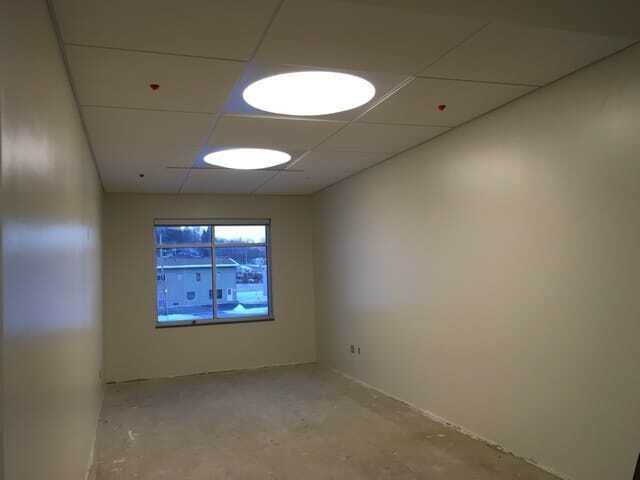 These classrooms have their lights installed. 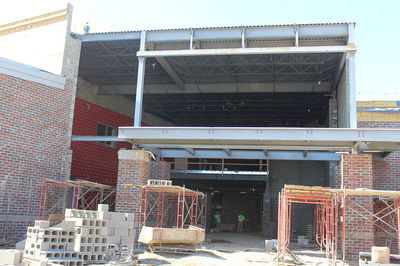 Overhang at the main entrance area. 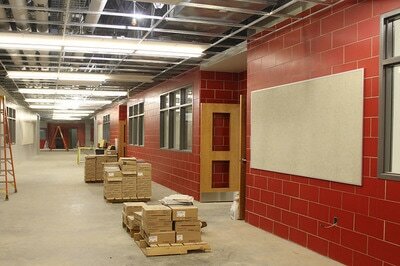 Outside view of the hallway that goes down past the band and choir rooms. 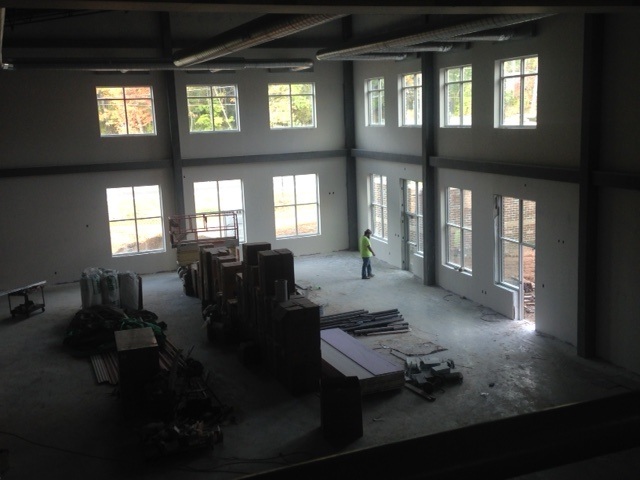 The large windows allow a good amount of natural light into this space. 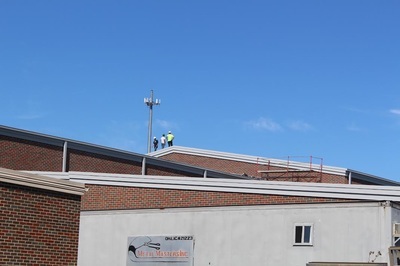 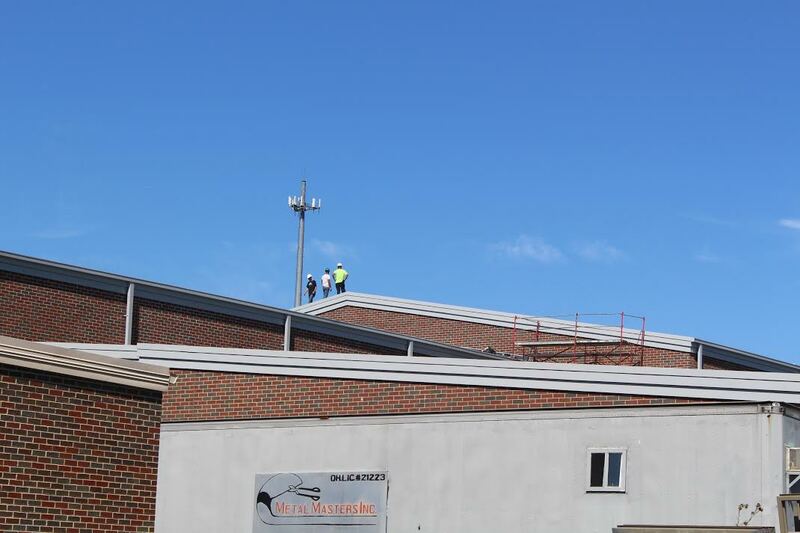 Workers from Advanced Industrial Roofing up on the auditorium roof. 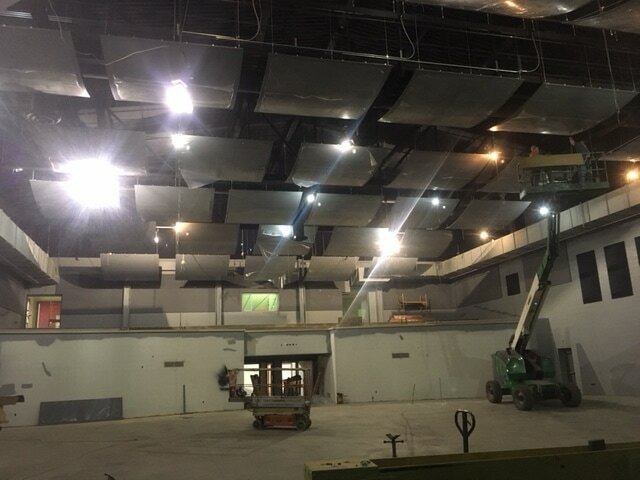 95% of the roof is now complete and most areas are dried in allowing finish work on the inside to really move along. 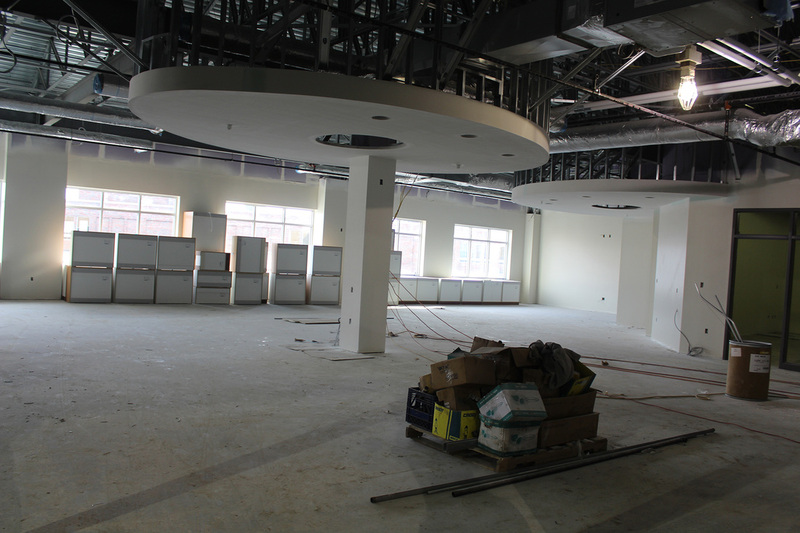 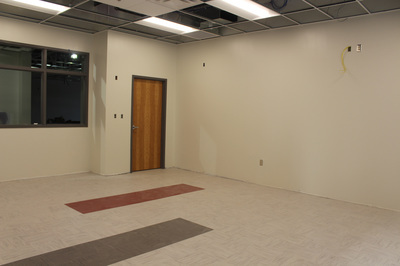 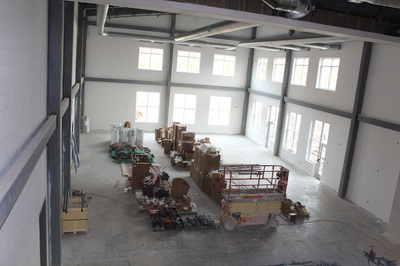 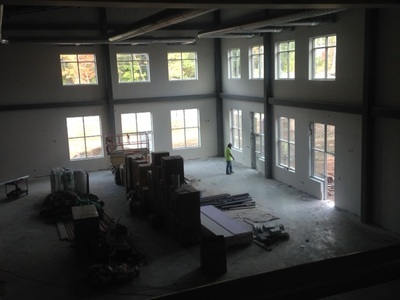 Second floor science room in the northwest corner of the building. As you can see walls are painted, lights are in and built in furniture is being placed. 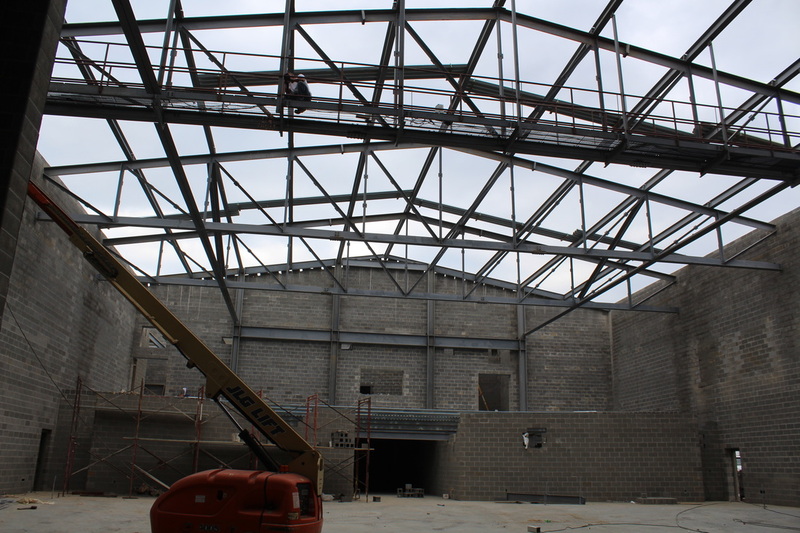 Stark Truss is delivering some of the last trusses that will be needed. Most of the roof structure is in place. 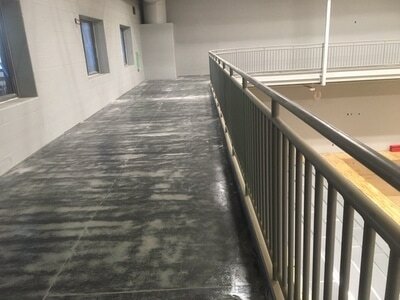 The red ash gym has the primer coat of paint on it. The final finishes will have more color to it. 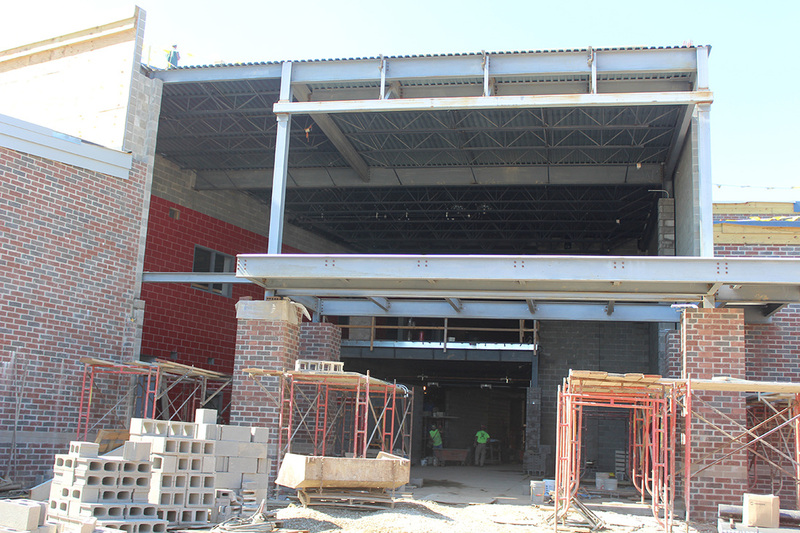 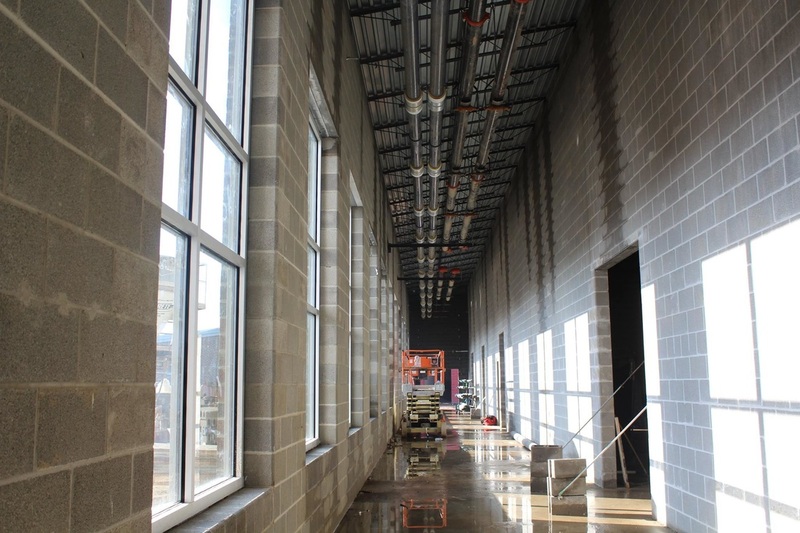 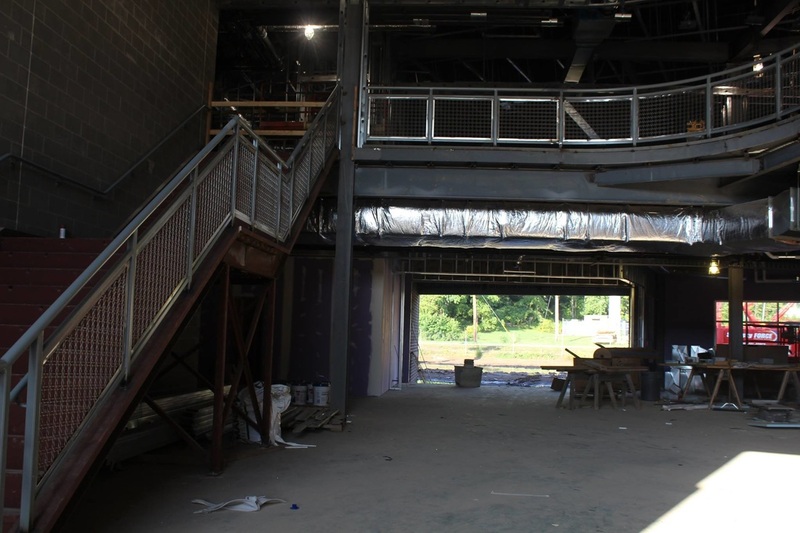 This is the hallway outside the band and choir rooms...the big openings are windows towards the stadium. The structure for the balcony in the auditorium is complete. 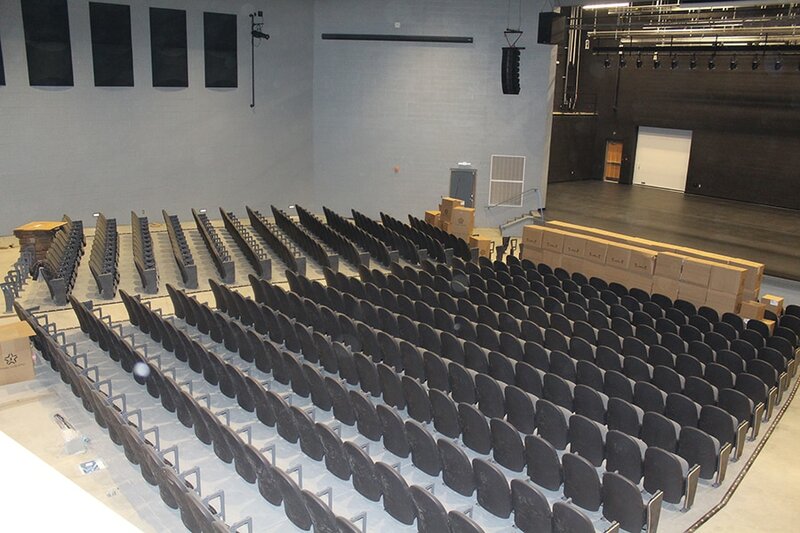 This picture was taken from the stage. 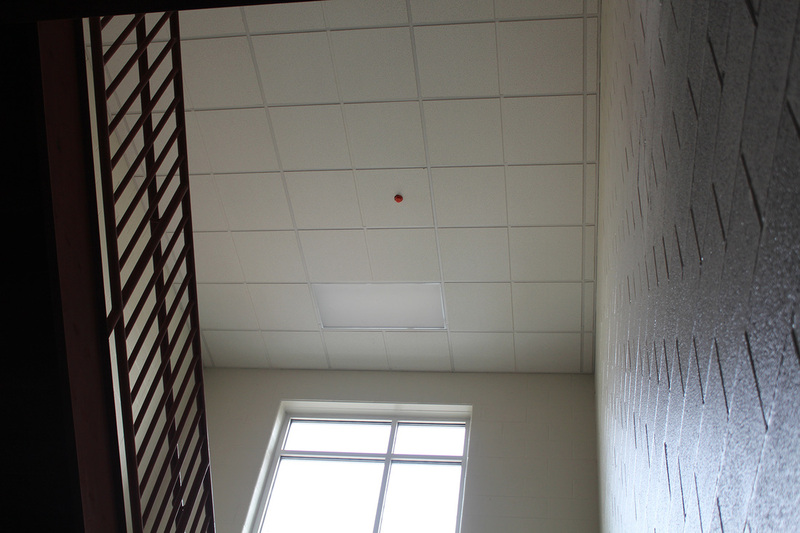 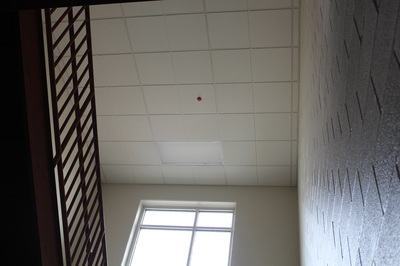 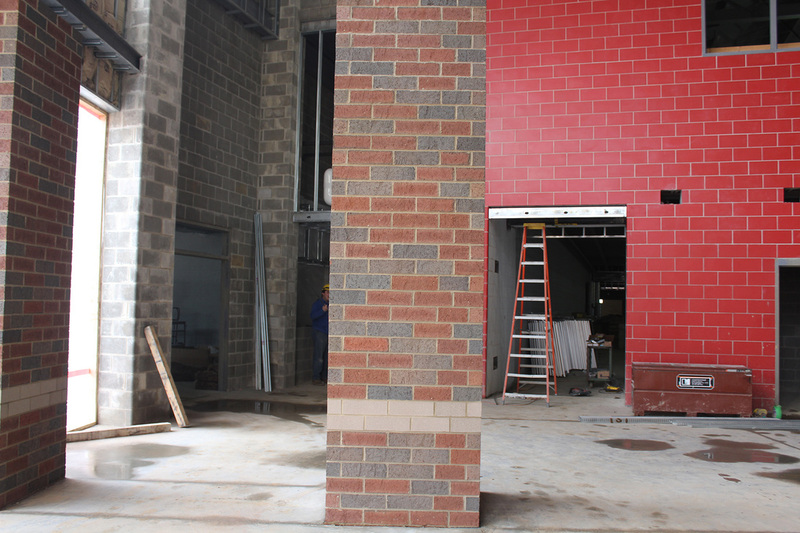 You can see the red block that is in the main hallway between the high school offices and the cafeteria. 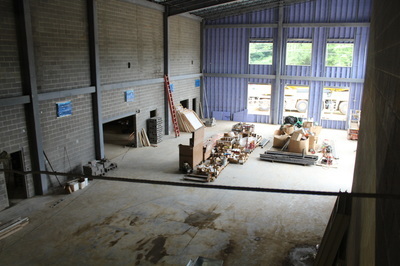 This is a picture of the cafeteria area. The drywall is up in some areas and being prepared for painting. 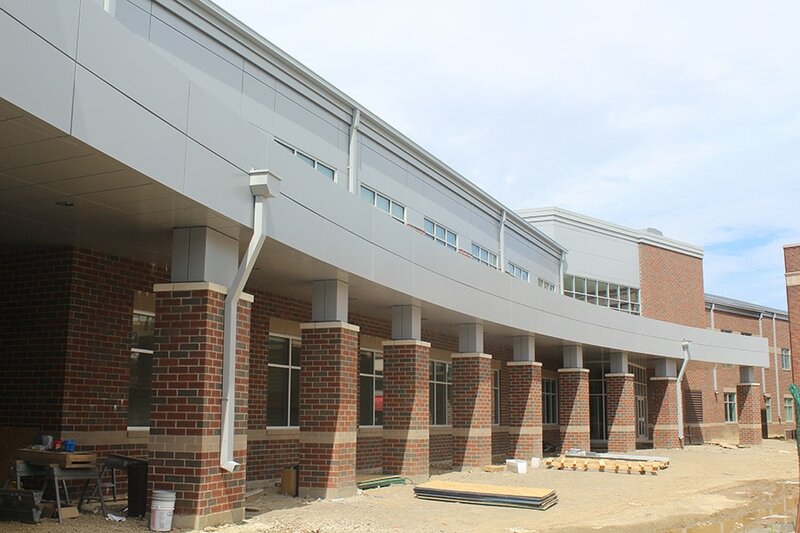 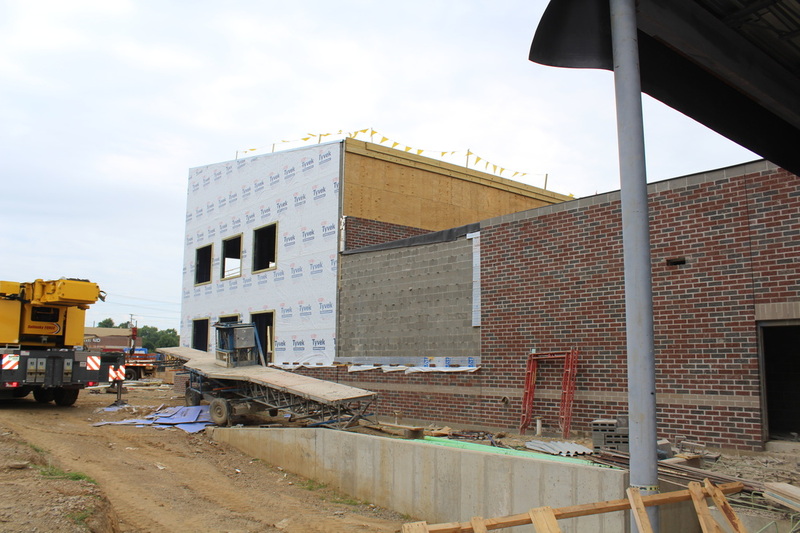 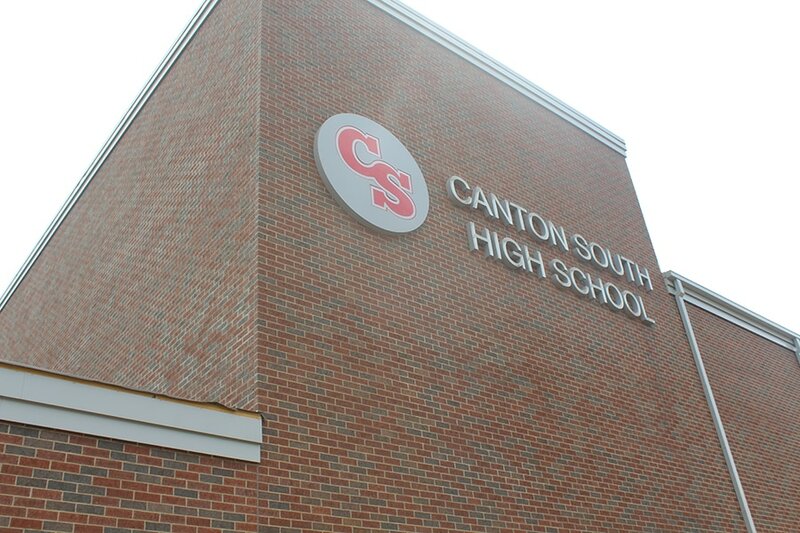 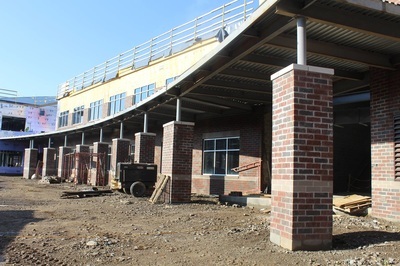 In exactly one year the new Canton South High School is scheduled to be complete. 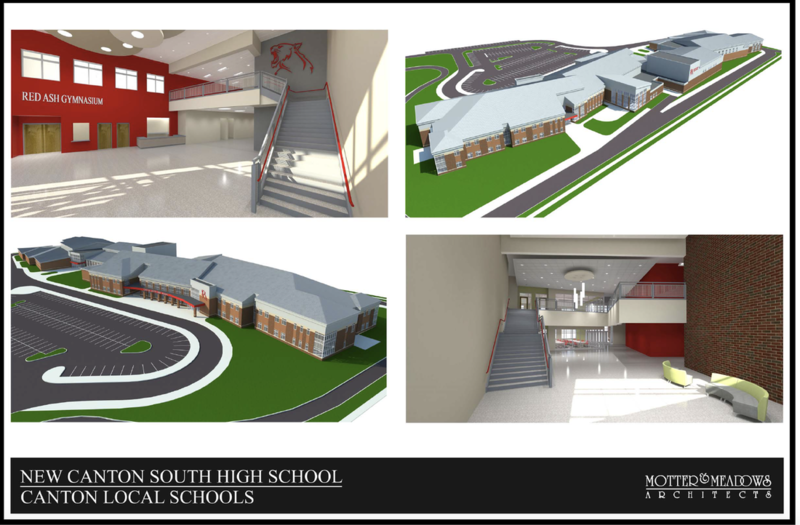 April 2017 will be here before we know it. 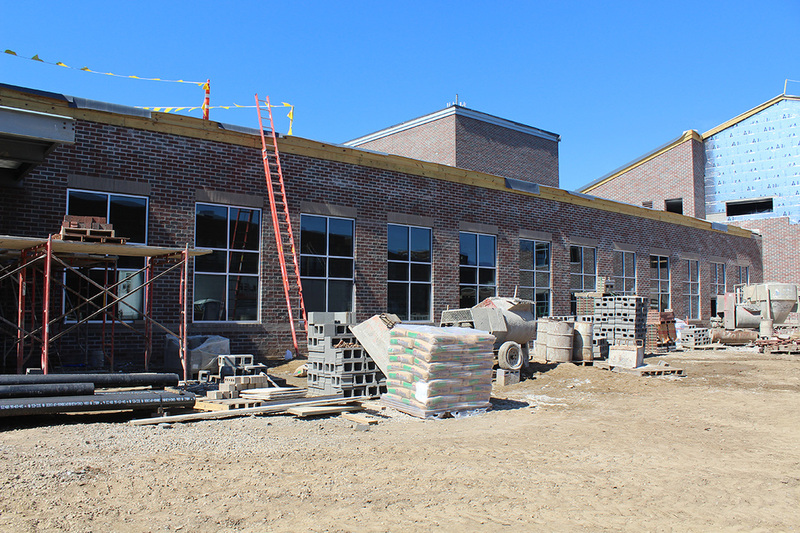 The building will open for the 2017-18 school year! 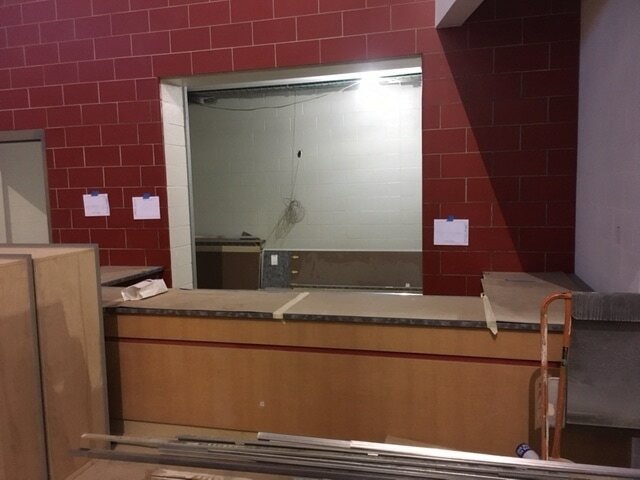 Here are a few pictures to highlight the current progress. 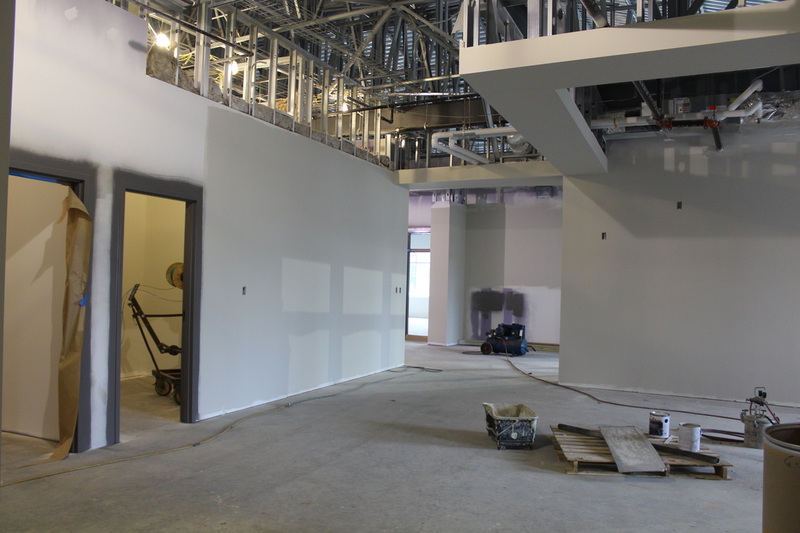 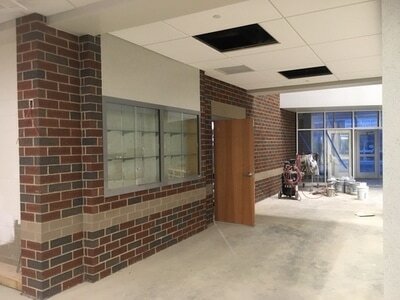 The door frame to the right is the one that you will go through to get to the waiting area of the High School office.